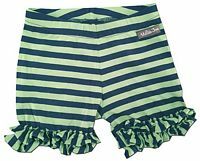 These are the beautiful Rivers and Streams shorties from Matilda Jane's Hello Lovely collection, in a vibrant grass green and navy striped 95% Cotton 5% Spandex, with cute double ruffle trims on the legs. 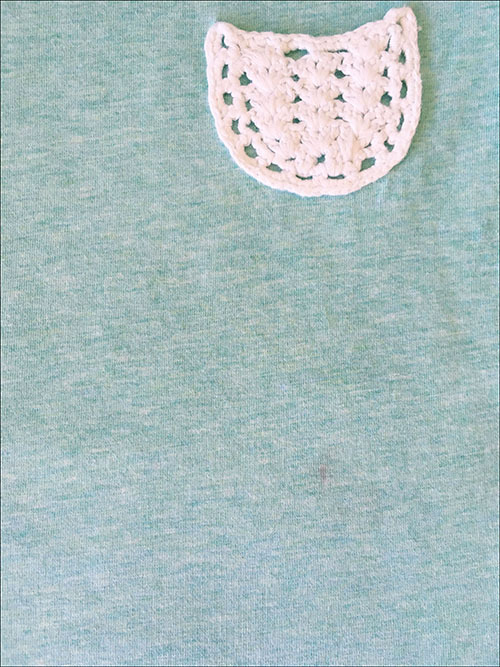 My camera hasn't come close to capturing the prettiness of the green in these so please to refer to the stock photo also. 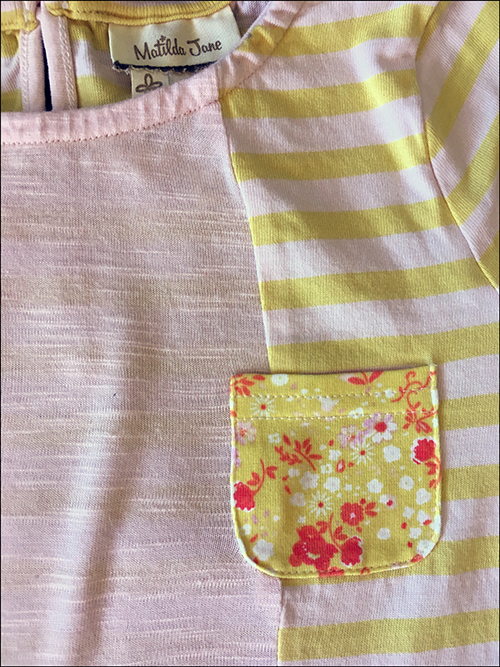 Size 4, they're about 24cm long on the outer legs and 10cm long on the leg inseam and are in excellent, gently used condition. 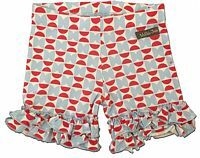 These are the pretty Ship Shape shorties from Matilda Jane's Hello Lovely collection, in nautical colours of red, white and blue (my photos make them look a little more cream than they actually are) 95% Cotton 5% Spandex, with cute double ruffle trims on the legs. 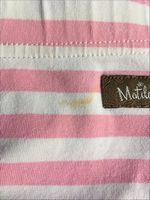 Size 4, they're about 24cm long on the outer legs and 10cm long on the leg inseam, and in excellent, gently used condition overall with just very light, even wash fade. 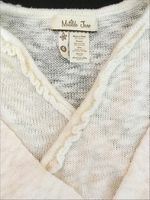 They do have one small stain on the left side seam as shown which may shift with a wash, otherwise priced lower than the others to reflect the flaw. 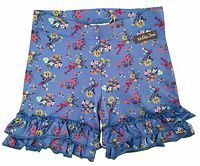 These are the beautiful Lovely Garden shorties from Matilda Jane's Vault, in a lovely Jacaranda Blue floral 95% Cotton 5% Spandex, with cute double ruffle trims on the legs. 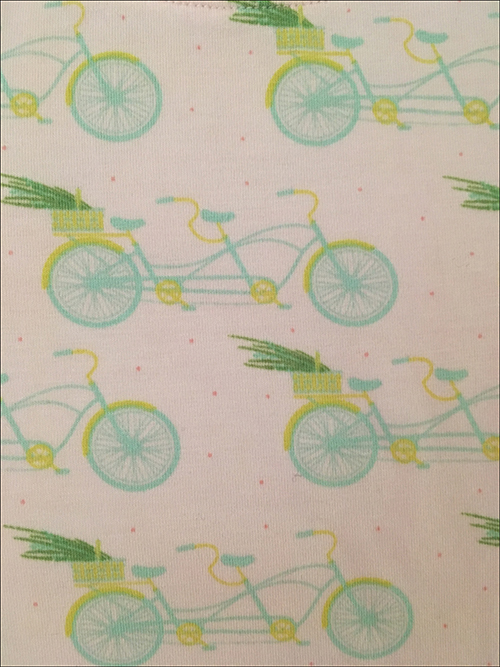 This was such a hard colour to capture and my photo makes them look a little more purple than they actually are, so I have included the stock photos of the leggings that use the same fabric to give you a better idea. 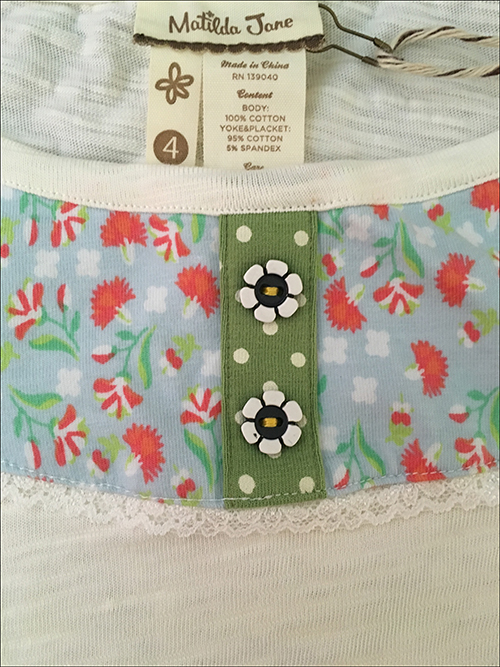 Size 4, they're about 24cm long on the outer legs and 10cm long on the leg inseam and are brand new with tags. 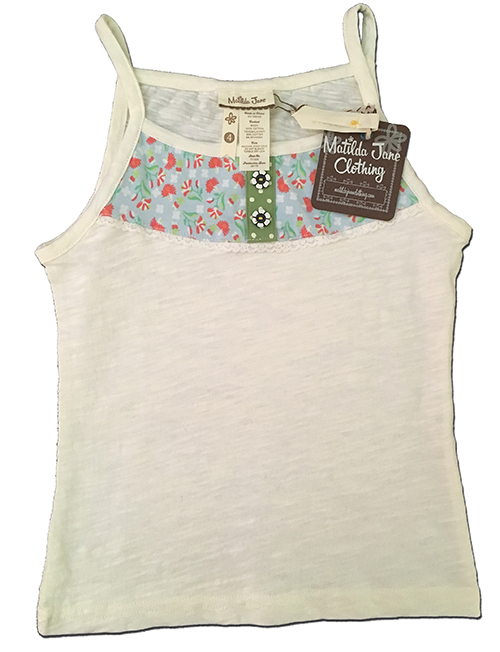 This is the Scenic Route tank top from Matilda Jane's Hello Lovely collection, in a cream slub cotton with lovely floral bodice and flower shaped buttons. 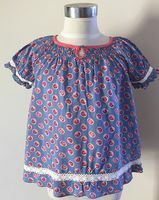 Size 4, it's about 58cm around the chest under the arms and 42cm long shoulder to hem, and is brand new with tags attached. 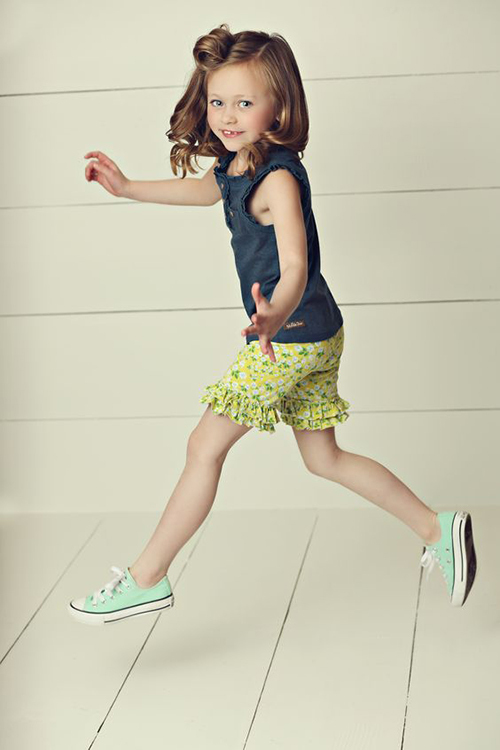 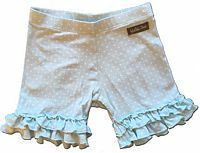 These are the lovely Summer Sky shorties from Matilda Jane's Hello Lovely collection, in a pretty mint polkadot 95% Cotton 5% Spandex, with cute double ruffle trims on the legs. 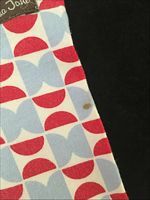 These are a Size 4, measuring about 26cm long on the outer legs and 13cm long on the leg inseam, and are in great, gently used condition overall - on close inspection I can find some super-faint (too light to even photograph) marks on the backside but they would never be noticeable when worn. 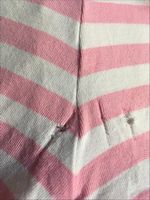 As a bonus, I'm also including a pair of the Candy Striper shorties from the same collection which are playwear only due to a mark on the front left hip as well as 3 small, laddered holes on the backside as shown. 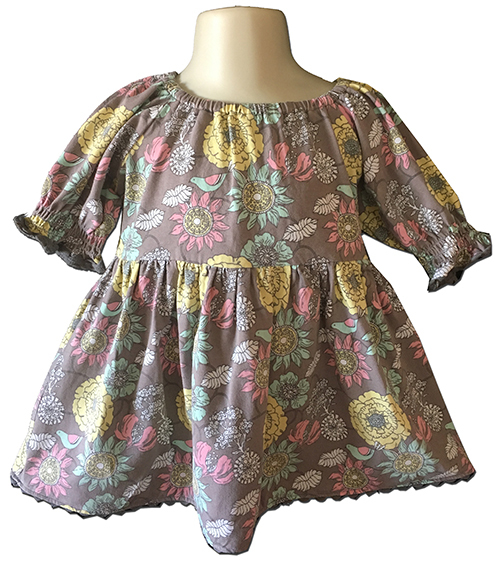 This is the sweet Fresh Cut Peasant Top from Matilda Jane's Hello Lovely collection, in a soft and stretchy 95% Cotton 5% Spandex blend jersey in mocha with retro pastel floral and bird print. 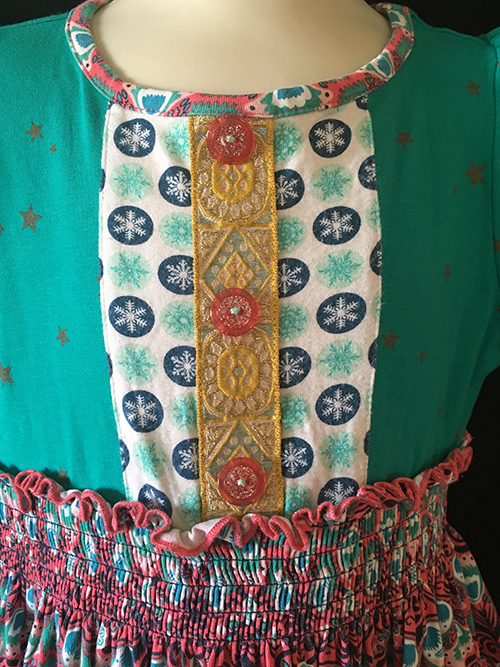 Size 4, it's about 66cm around the chest under the arms unstretched and 40cm long shoulder to hem, and is in excellent, gently used condition. 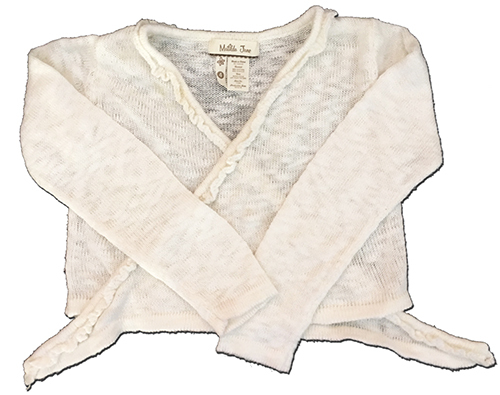 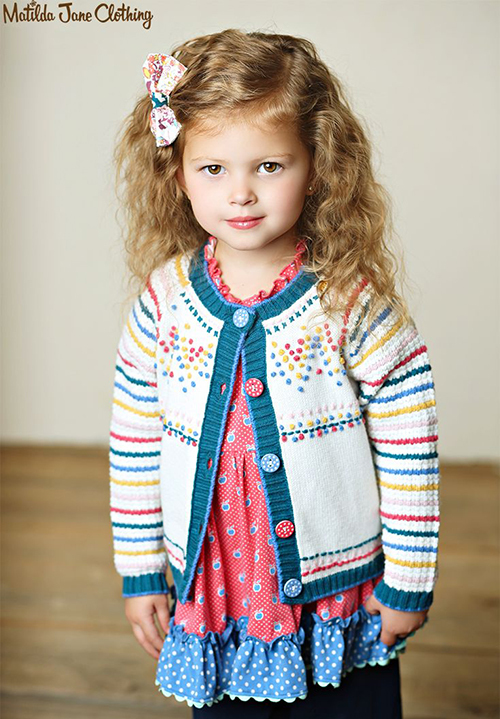 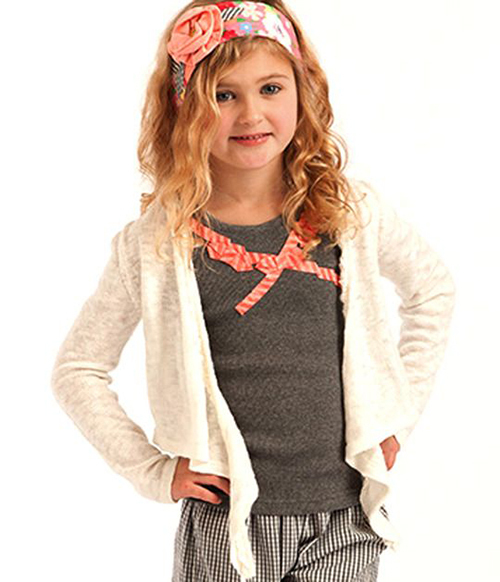 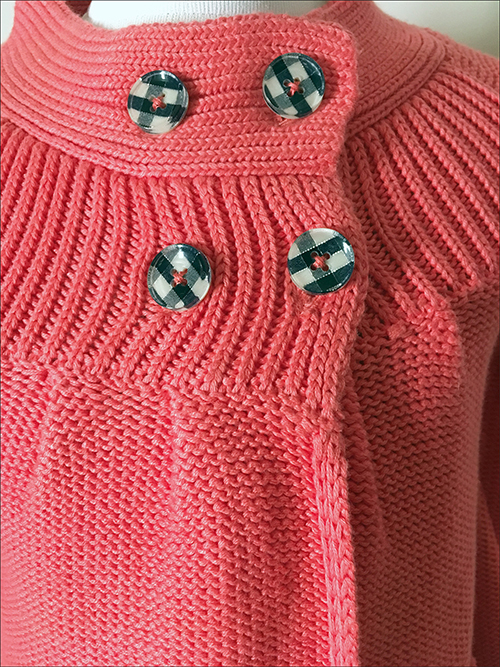 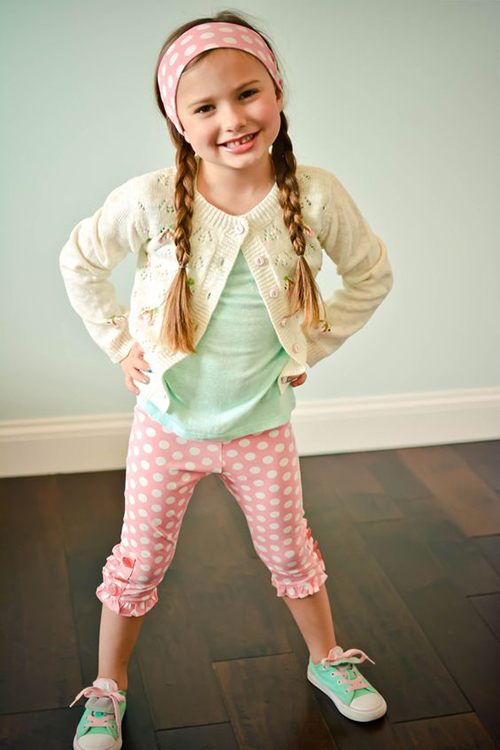 This is the beautiful On the Spot Cardigan from Matilda Jane's Hello Lovely collection, in a 50% Cotton 50% Acrylic blend with lovely ribbon detailing behind the buttons. 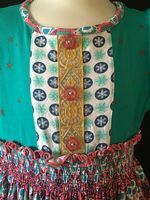 Size 4, it's about 70cm around the chest under the arms and 37cm long shoulder to hem, and in excellent, gently used condition. 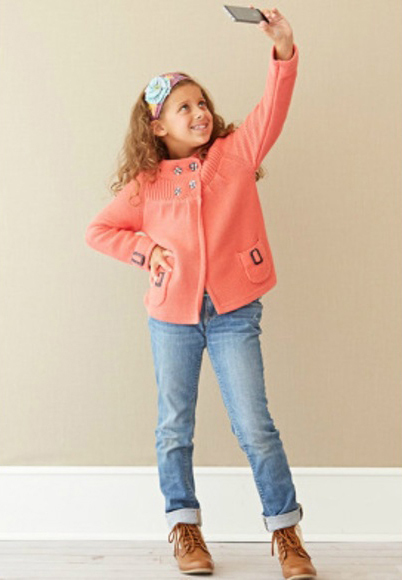 This is the beautiful Flutterby Wing Sweater from Matilda Jane's Secret Fields collection, in a coral coloured (hard to capture, closer to the stock pic) heavyweight 95% Cotton 5% Spandex knit with adorable navy gingham buttons and pretty buckle detailing on the front pockets and wrists. 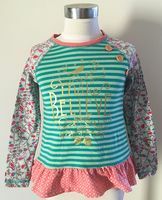 Size 4, it's about 70cm around the chest under the arms and 50cm long shoulder to hem, and is brand new with tags attached. 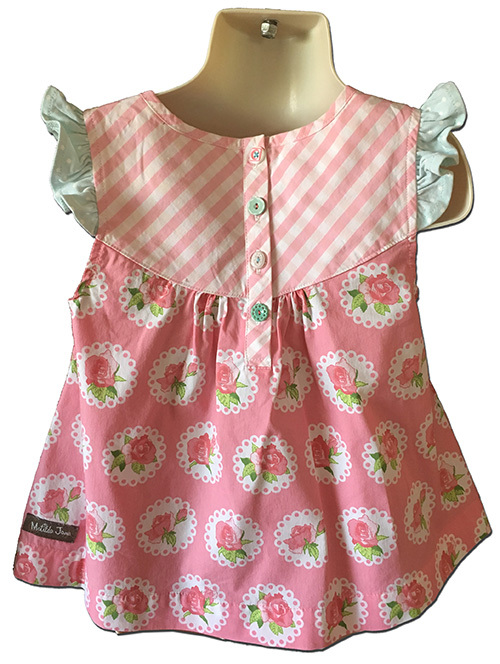 This is the beautiful Al Fresco top from Matilda Jane's Hello Lovely collection, in a crisp stretch cotton blend with sweet jersey flutter sleeves and a wonderful rose and stripe print. 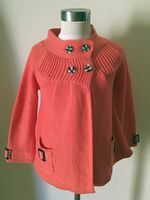 Size 4, it's about 66cm around the chest under the arms and 38cm long shoulder to hem, and in excellent, gently used condition. 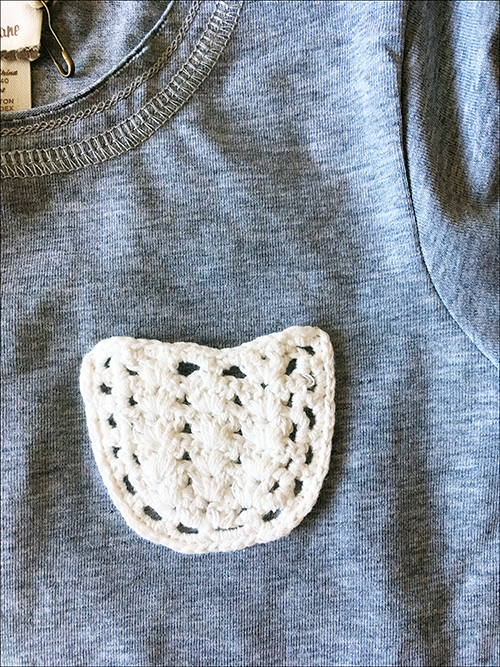 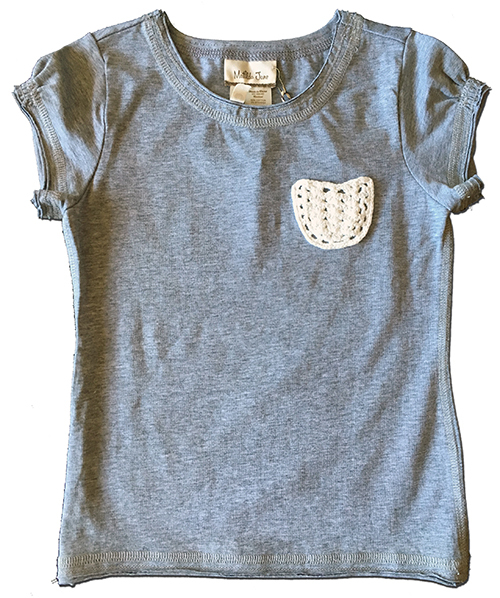 This is the a fab little basic tee from Matilda Jane's Hello Lovely collection, in a Slate (grey marle) 95% Cotton, 5% Spandex blend, with raw hems and a sweet crochet pocket on the chest. Size 4, it measures about 58cm around the chest under the arms and 41cm long shoulder to hem, and is New With Tags. 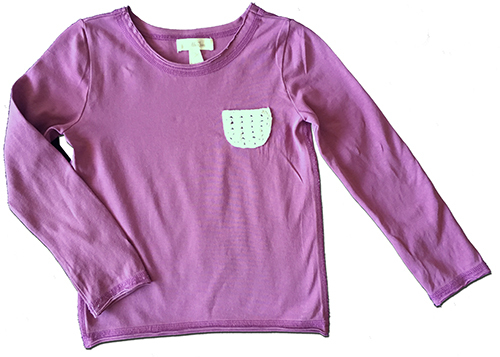 I'm also including the Mist colourway which is identical in all respects except, of course, for the colour, and for the fact that it's been used and is probably best treated as playwear with a few light marks on the front that haven't soaked out. 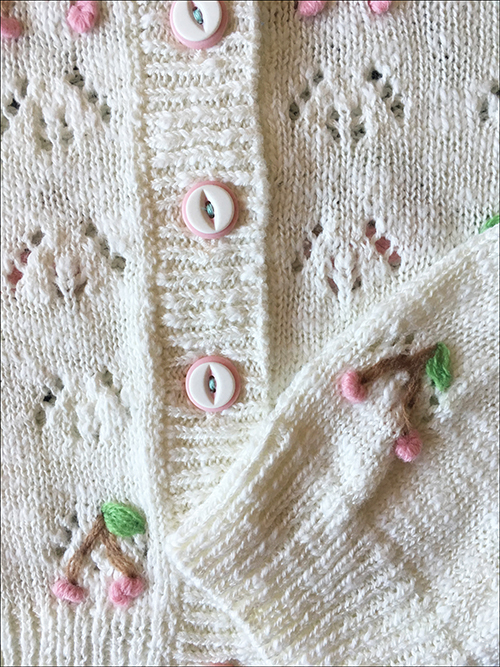 A tonne of life left in this lovely piece yet though! 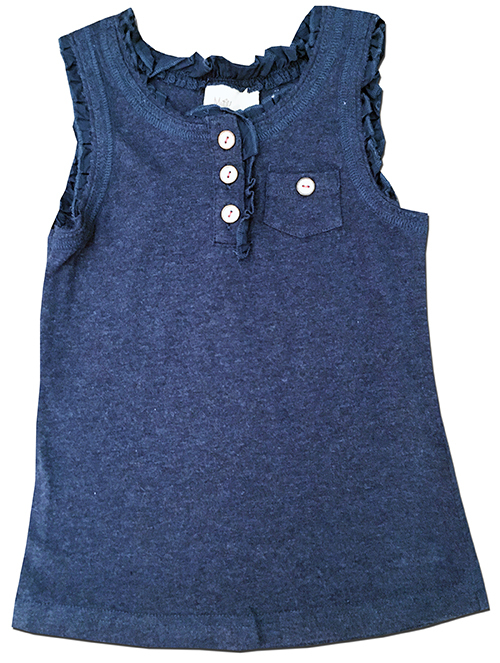 This is the beautiful Simple Things tank from Matilda Jane's Hello Lovely collection, in a soft and stretchy 95% Cotton 4% Spandex blend in the prettiest shade of deep blue. 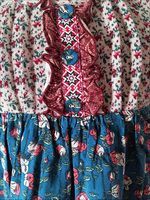 Size 4, it's about 56cm around the chest under the arms and 41cm long shoulder to hem, and in excellent, gently used condition. 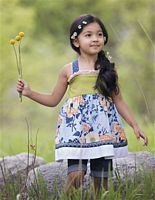 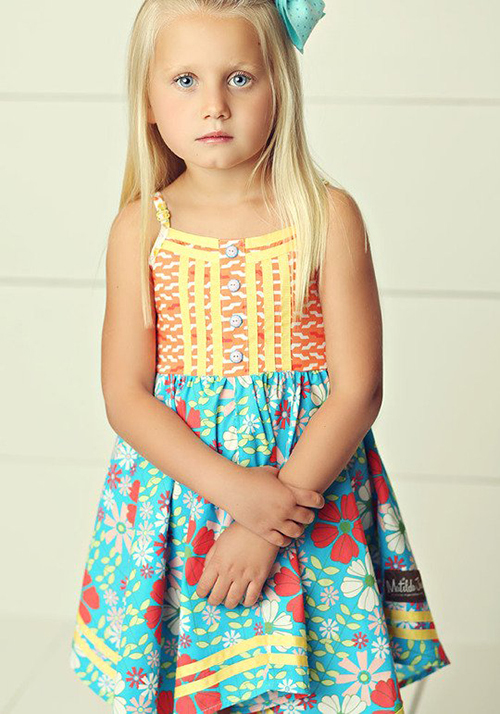 This is the gorgeous Always Twirling dress from Matilda Jane's Hello Lovely collection, in a crisp cotton blend with adjustable shoestring shoulder straps, shirred, elasticised rear bodice, grosgrain ribbon trims and an amazingly full, asymmetrical skirt for superb twirl factor as the name implies! 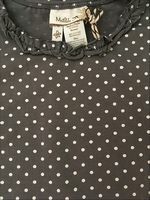 Size 4, it's about 50cm around the chest under the arms unstretched and 65cm long shoulder to the longest point of the hem (adjustable), and I suspect this is new without tags. 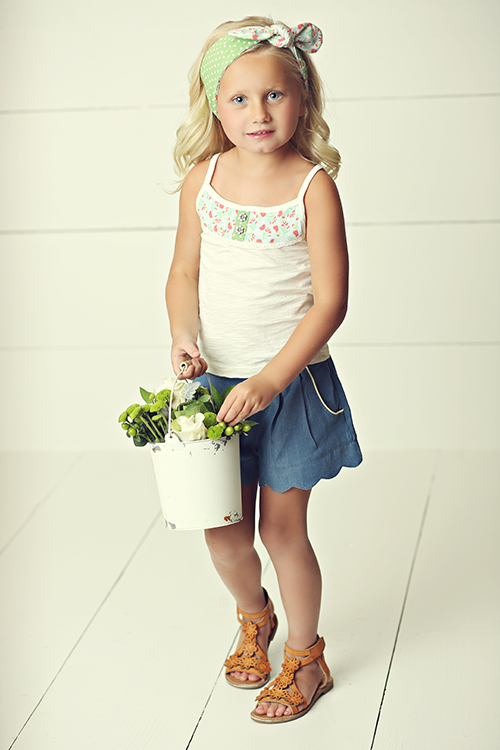 This is the gorgeous In the Garden tank top from Matilda Jane's Hello Lovely collection, in a soft and stretchy 96% Cotton 4% Spandex blend and featuring a beautiful vintage rose print, intricate navy embroidery along the arm holes and a dropped waist with shirred, elasticised waistband. 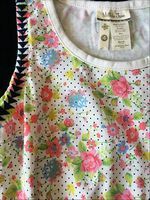 Size 4, it's about 64cm around the chest under the arms and 45cm long shoulder to hem, and in excellent, gently used condition. 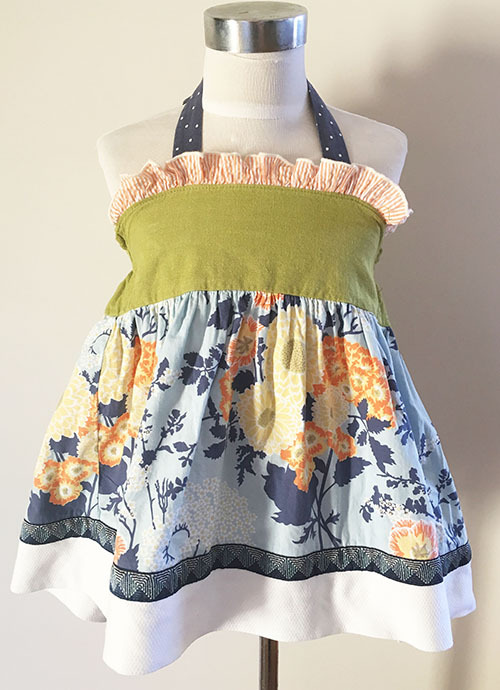 While it lasts, I also have this listed in a Size 12 if one were needed for an older sibling. 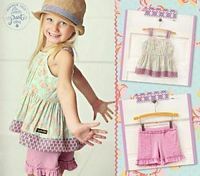 These are the beautiful Medallion shorties from Matilda Jane's Hello Lovely collection, in a pink and white print 95% Cotton 5% Spandex, with cute double ruffle trims on the legs. 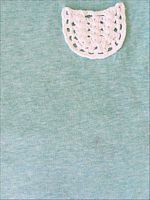 My camera hasn't come close to capturing the prettiness of the green in these so please to refer to the stock photo also. 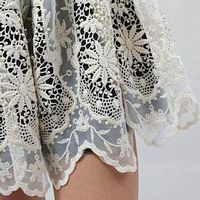 Size 4, they're about 24cm long on the outer legs and 10cm long on the leg inseam and are in excellent, gently used condition. 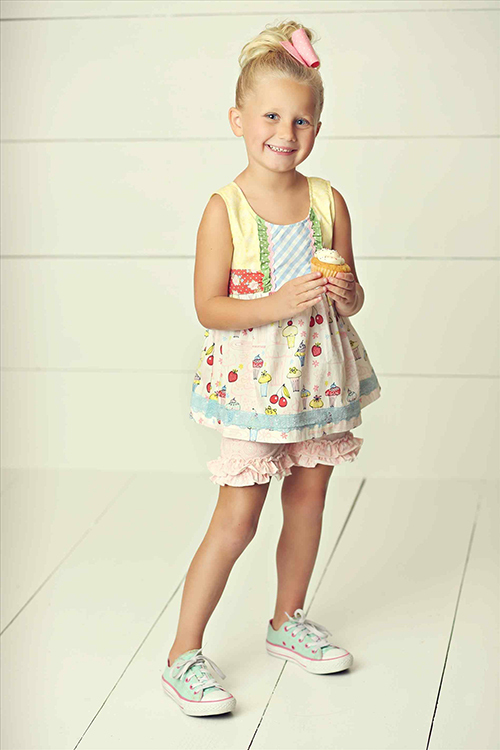 Lovely with both the Take the Cake top and Beaming Brightly tank listed separately while they last, as shown in the stock photos. 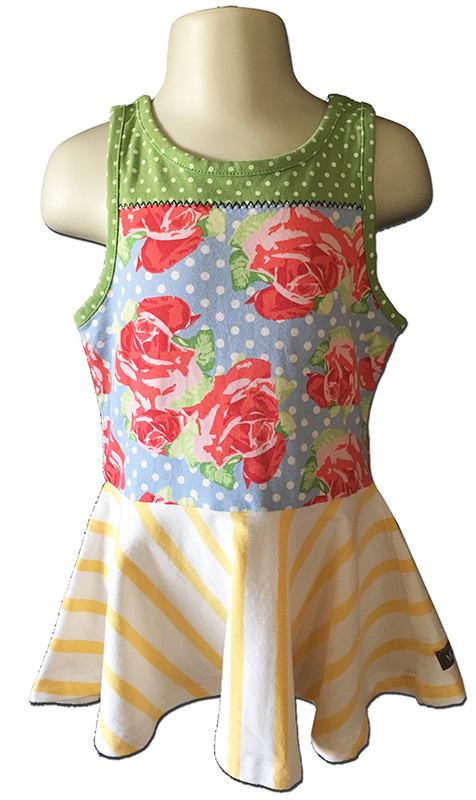 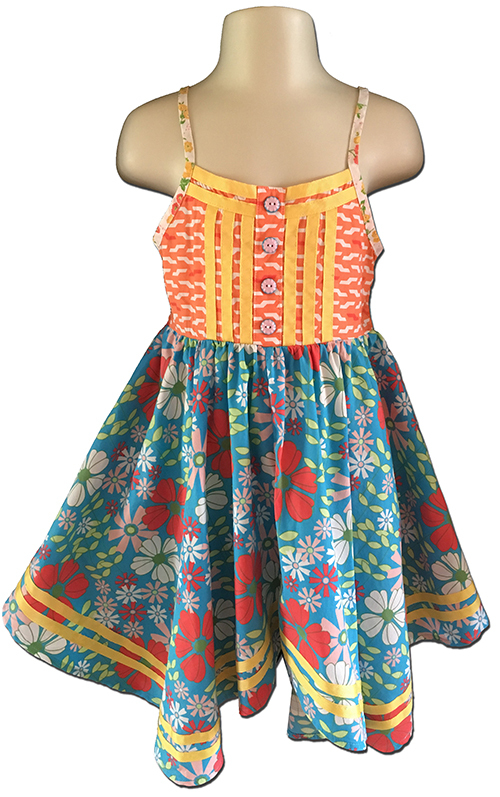 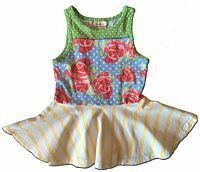 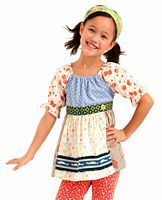 This is the beautiful Beaming Brightly tank top from Matilda Jane's Hello Lovely collection, in a soft and stretchy 97% Cotton 4% Spandex blend and the most fantastic mix of prints - a vibrant rose print and polkadot bodice meeting a yellow and white striped skirt hemline. 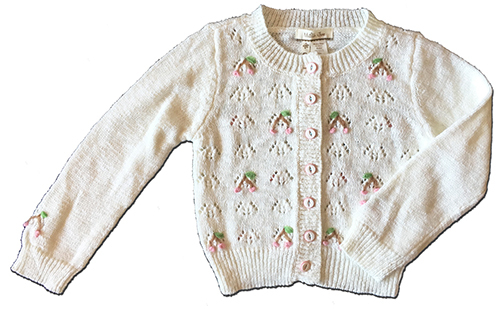 Size 4, it's about 56cm around the chest under the arms and 49cm long shoulder to hem, and is in excellent, barely used condition. 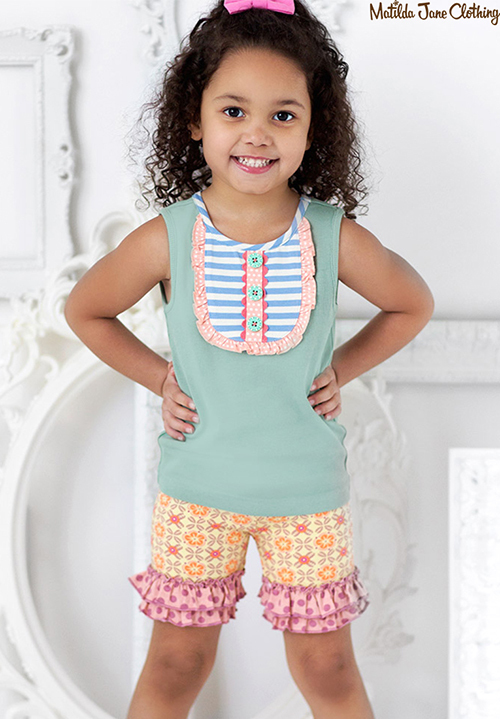 Lovely with the Medallion shorties listed separately while they last, as shown in the stock photos. 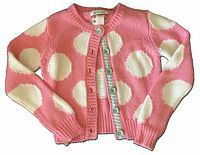 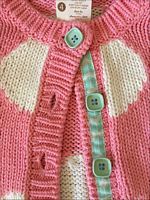 This is the beautiful Sweet Cherries Cardigan from Matilda Jane's Hello Lovely collection, in a soft 55% Cotton 45% Acrylic blend with adorable pink cherry detailing throughout. Size 4, it's about 64cm around the chest under the arms and 37cm long shoulder to hem, and in excellent, gently used condition. 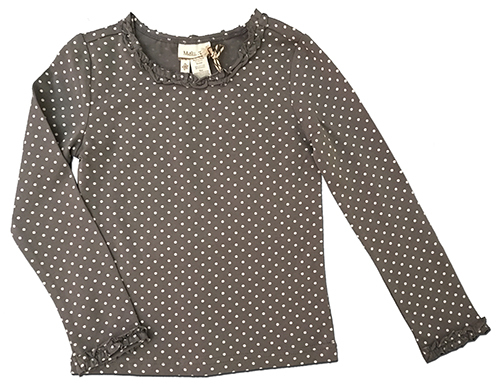 This is the gorgeous Connect the Dots long sleeved tee from Matilda Jane's Hello Lovely collection, in a Polkadot Slate 95% Cotton 5% Spandex blend with sweet ruffled trims. Size 4, it's about 56cm around the chest under the arms unstretched and 40cm long shoulder to hem, and is brand new with tags. 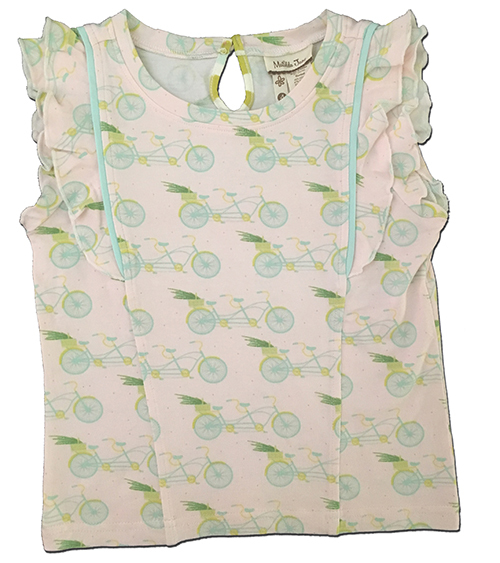 This is the pretty Easy Breezy tee from Matilda Jane's Hello Lovely collection, in a pale pink 48% Modal, 47% Cotton 5% Spandex blend with an all-over bicycle print and cute flutter trim sleeves. 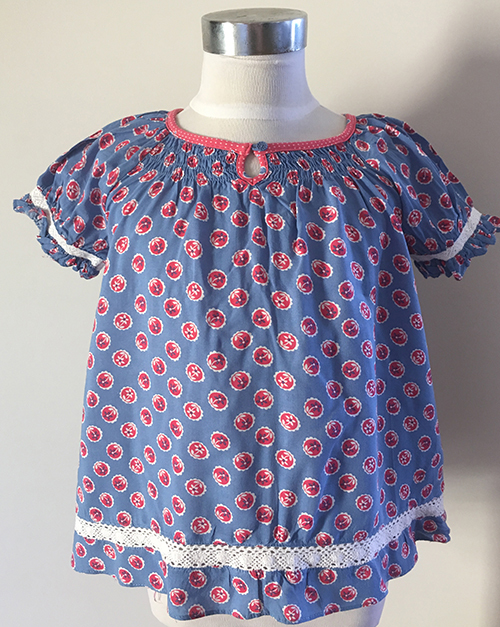 Size 4, it's about 64cm around the chest under the arms unstretched and 38cm long shoulder to hem, and is in excellent, gently used condition. 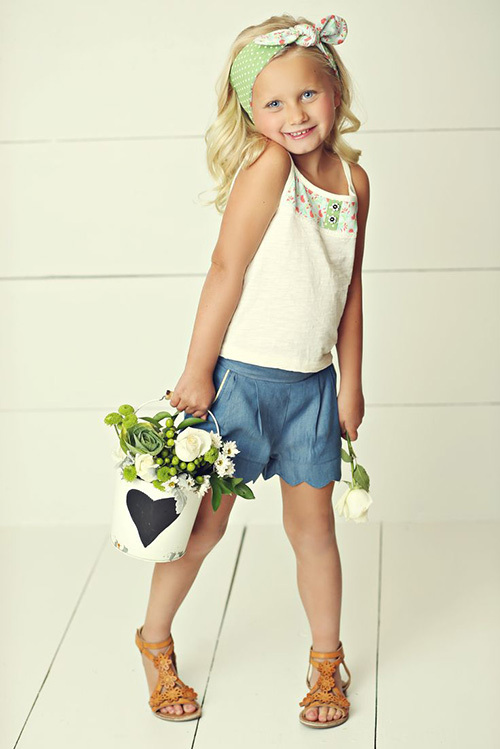 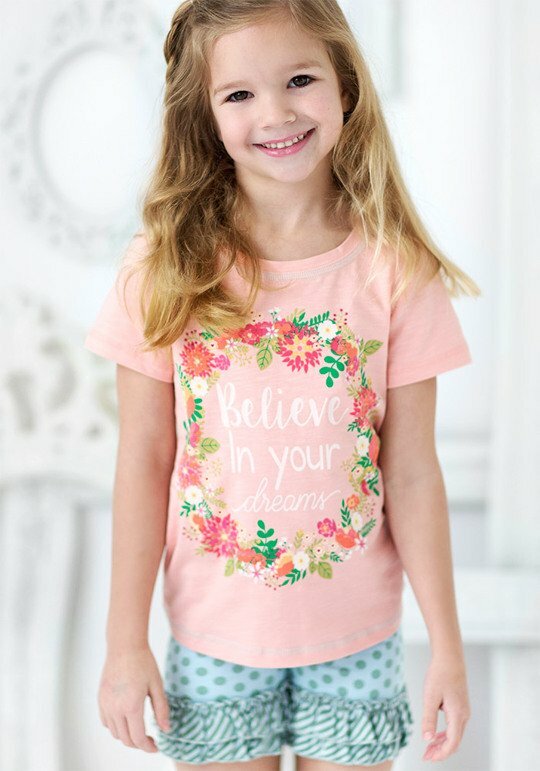 This is the cute Sun Drenched tee from Matilda Jane's Hello Lovely collection, in a panelled Cotton Viscose blend with a sweet floral chest pocket. Size 4, it's about 64cm around the chest under the arms unstretched and 41cm long shoulder to hem, and is in excellent, gently used condition. 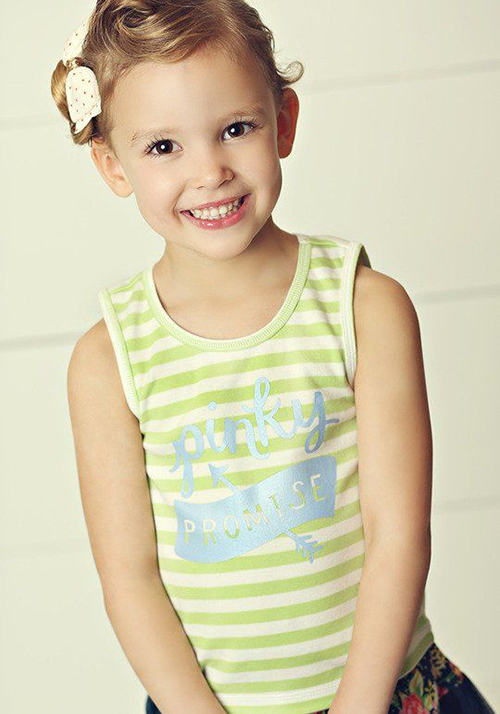 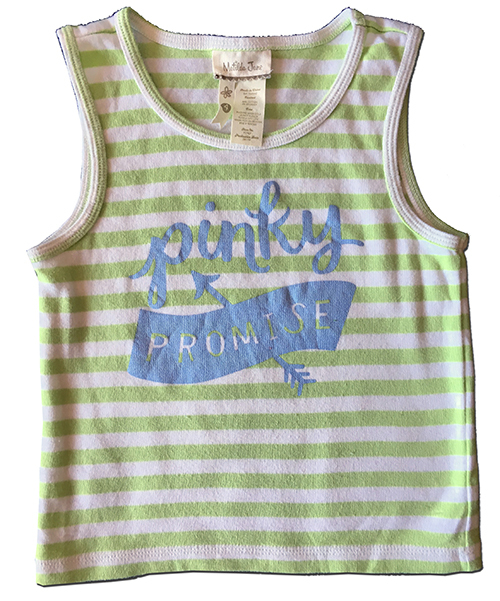 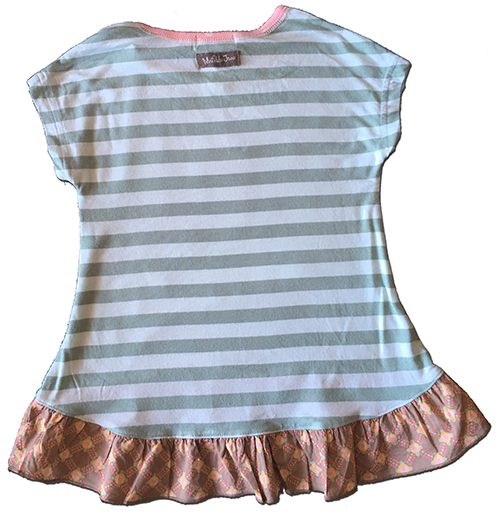 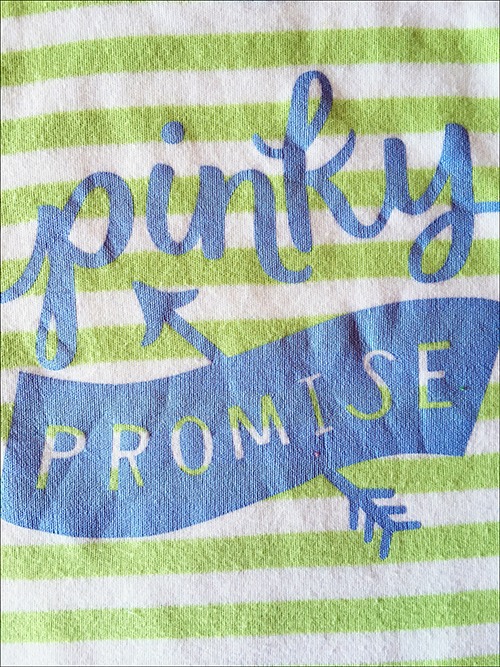 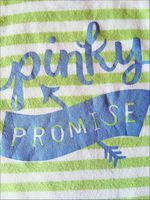 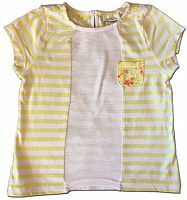 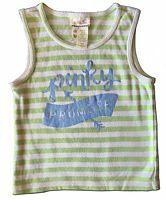 This is the adorable Pinky Promise tank top from Matilda Jane's Hello Lovely collection, in a green and white striped soft and stretchy 95% Cotton 5% Spandex jersey with the blue Pinky Promise chest print. 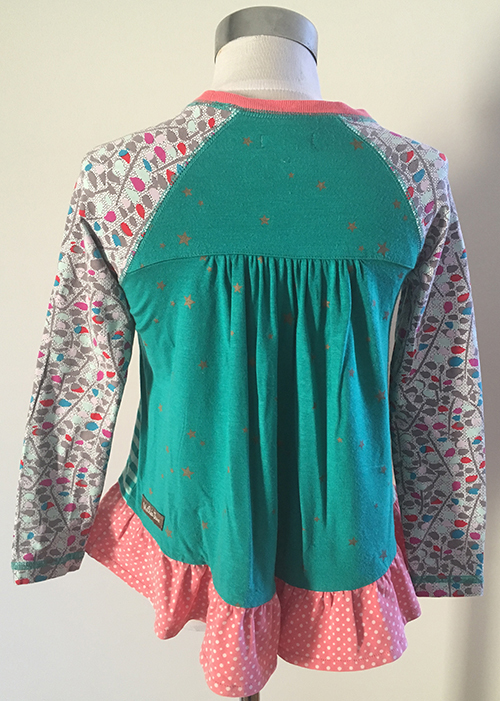 Size 4, it's about 56cm around the chest under the arms unstretched and 36cm long shoulder to hem, and in great used condition with just a little cracking starting to develop to the print. 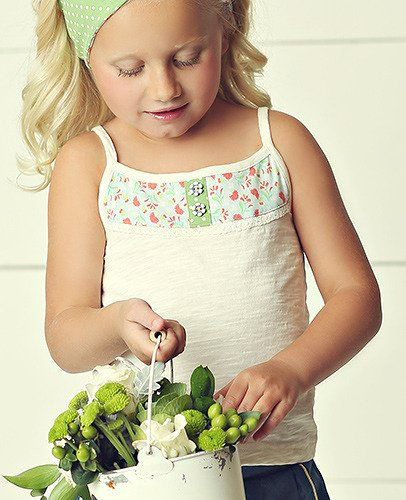 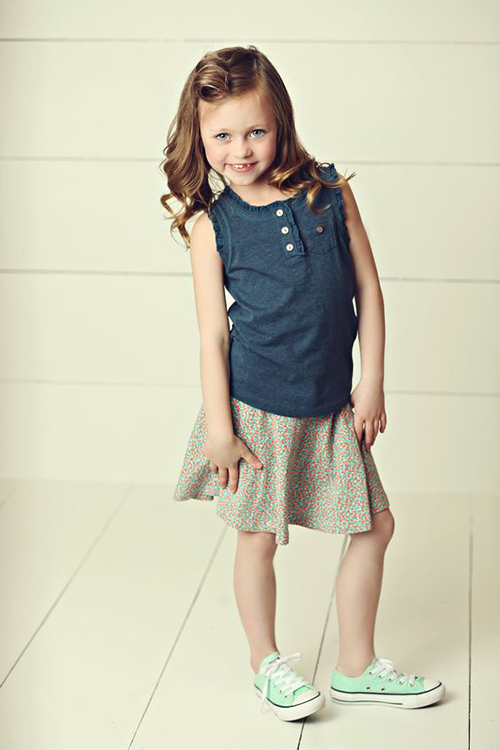 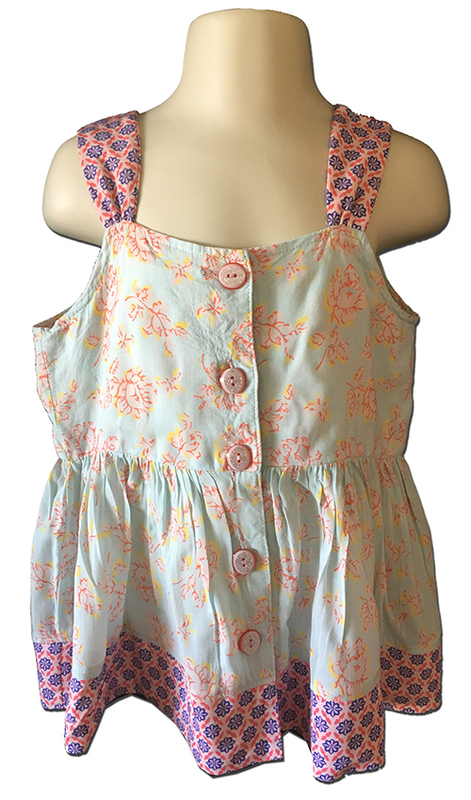 This is the lovely Sail Away tank top from Matilda Jane's Hello Lovely collection, in a light and floaty 100% Viscose with soft poly-rayon straps, and features lovely pintucking on the bodice and rear buttons. Size 4, it's about 62cm around the chest under the arms unstretched and 42cm long shoulder to hem, and is in great used condition with just mild, even wash fade. 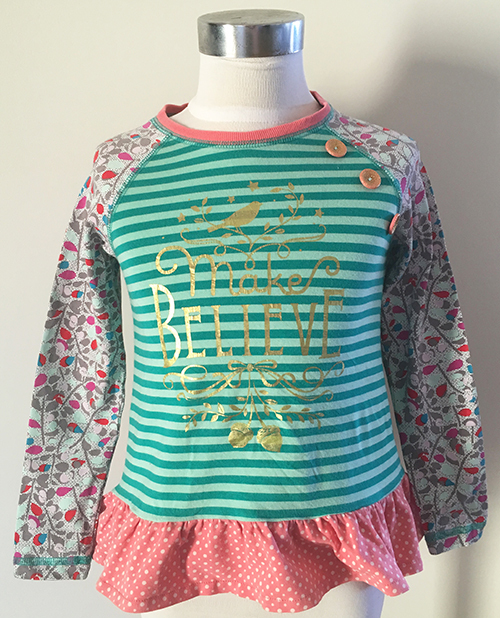 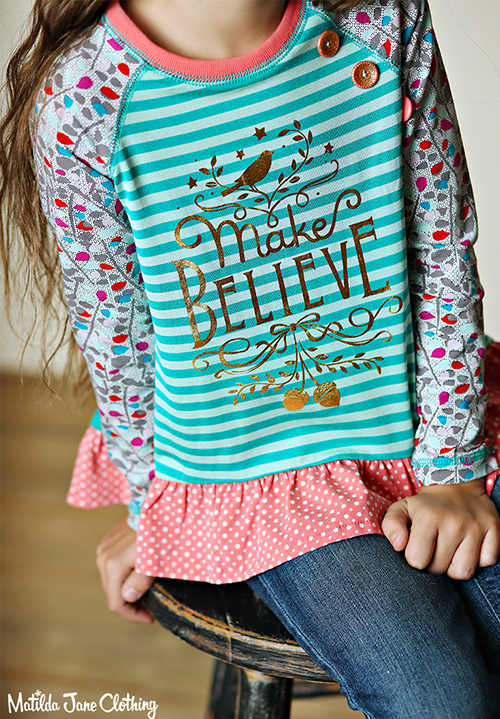 This is the adorable Cora top from Matilda Jane's Friends Forever collection, in a soft and stretchy 95% Modal 4% Spandex blend and featuring a pretty and vibrant mix of colours as well as a metallic gold chest print reading "Make Believe", along with a bird and acorns. 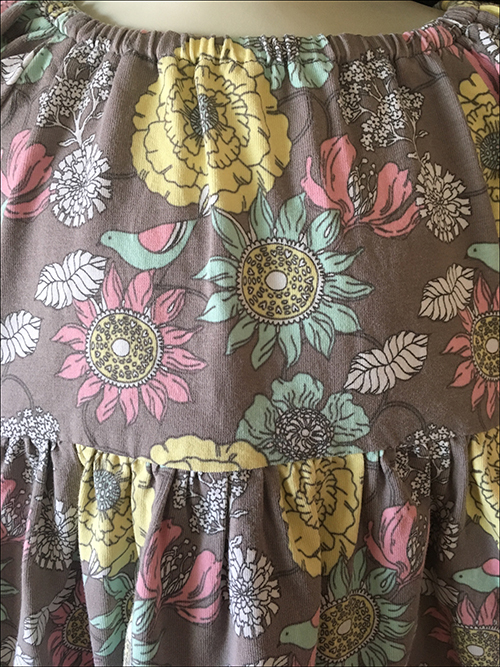 Size 4, it's about 66cm around the chest under the arms, 41cm long shoulder to front hem and 45cm to the rear hem, and in excellent, gently used condition with just light cracking starting to develop in the print. 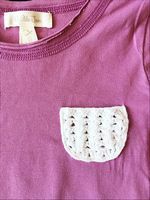 This is the pretty Marilyn top from Matilda Jane's Friends Forever collection, in a lilac 95% Cotton 5% Spandex blend with raw hemlines, contrast stitching and a pretty crochet pocket on the chest. 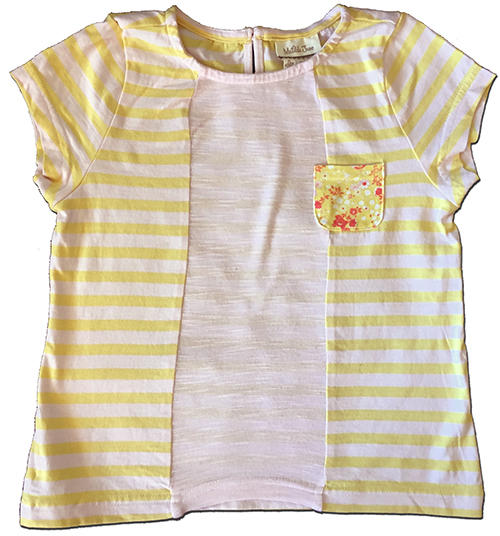 Perfect teamed with the Gabriella Sara top shown in the stock photos and listed separately while it lasts. 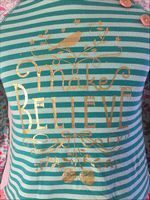 Size 4, it's about 60cm around the chest under the arms unstretched and 40cm long shoulder to hem, and in excellent, gently used condition. 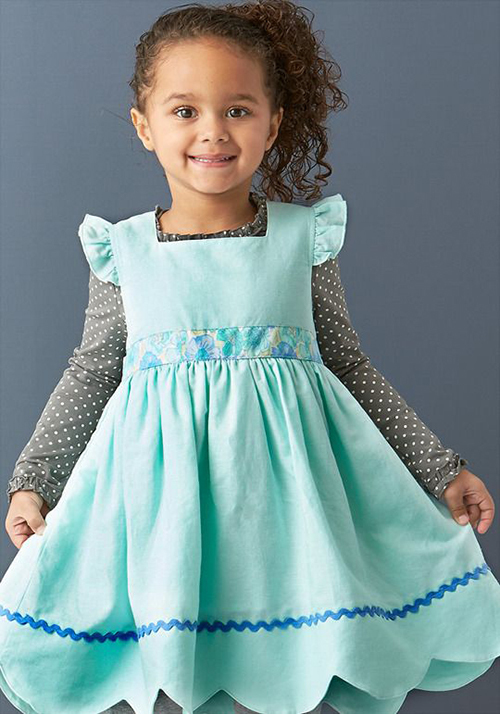 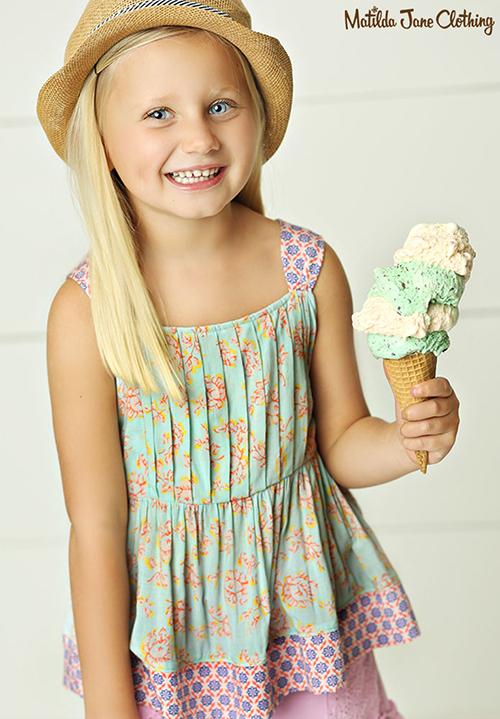 This is the beautiful Gabriella Sara top from Matilda Jane's Friends Forever collection, with a soft and cosy knit jersey bodice falling to a divine teal floral skirt. 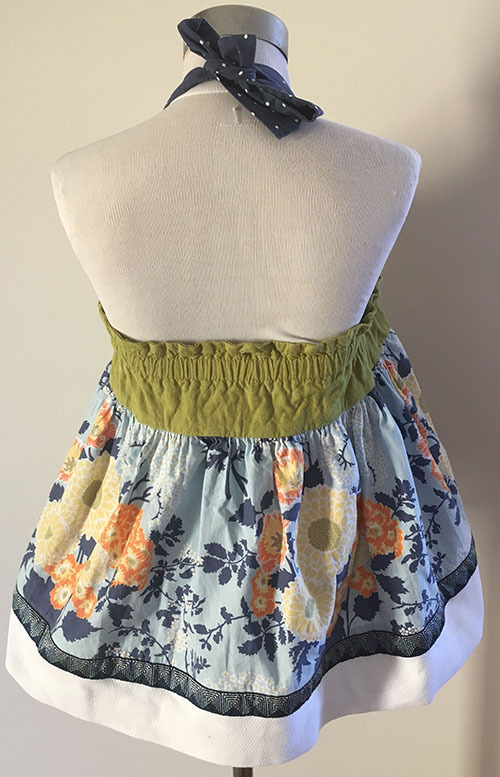 Size 4, it's about 62cm around the chest under the arms unstretched and 44cm long shoulder to hem, and is in excellent, gently used condition. Lovely when teamed with the Marilyn top shown in the stock photo, listed separately while it lasts. 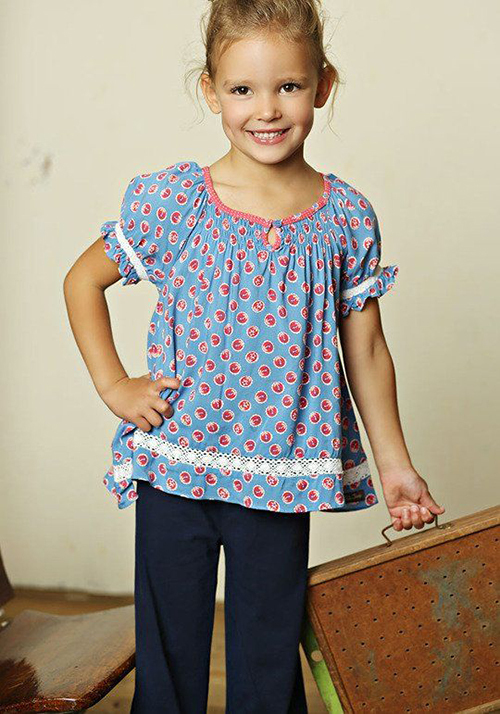 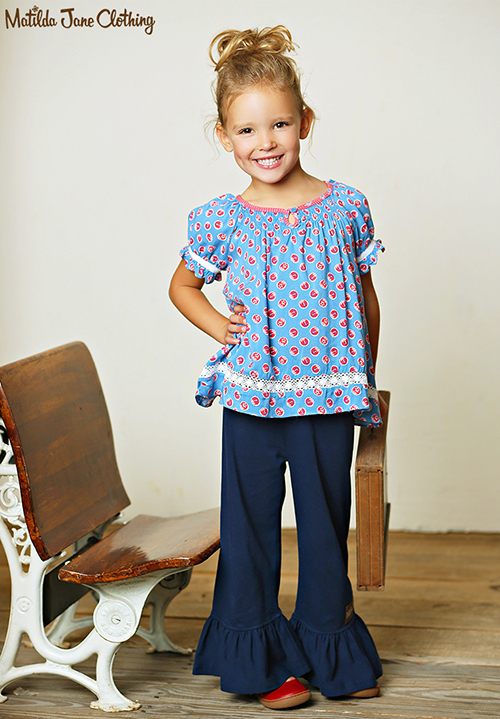 This is the sweet Darci top from Matilda Jane's Friends Forever Collection, in a floaty blue 100% Rayon with peasant styling, a ruched, elasticised neckline and lovely crochet trims. 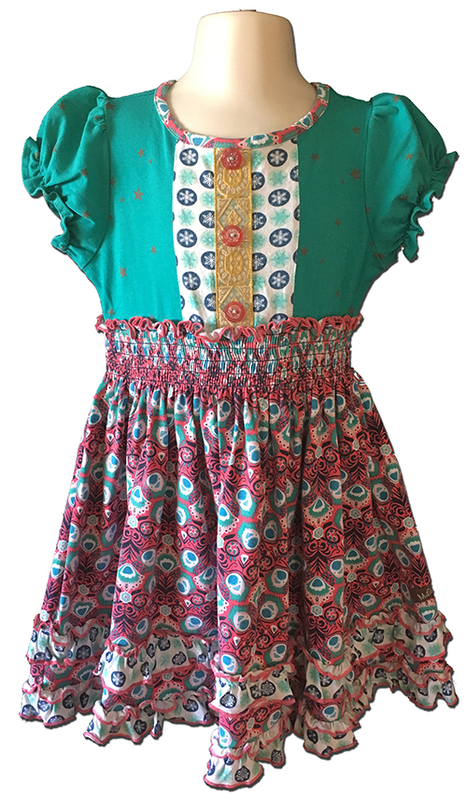 Size 4, it's about 76cm around the chest under the arms and 46cm long shoulder to hem, and is in excellent, gently used condition. 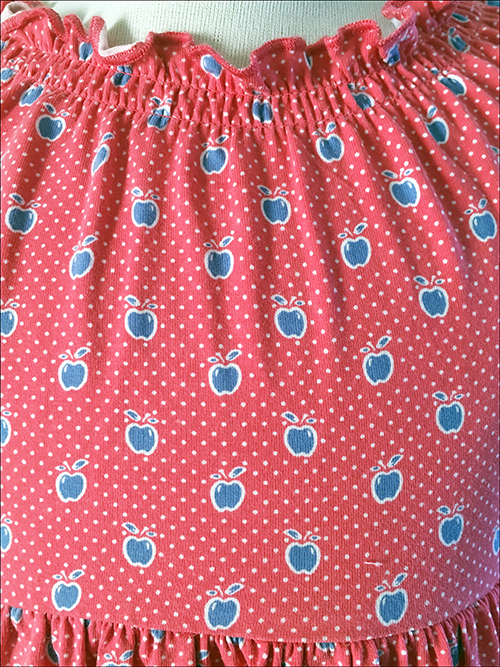 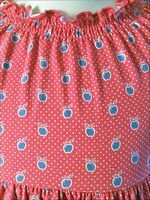 This is the lovely Jennifer Peasant top from Matilda Jane's Friends Forever Collection, in a soft and stretchy 95% Cotton 5% Spandex blend apple print with an elasticised waistband and fun polkadot trims. 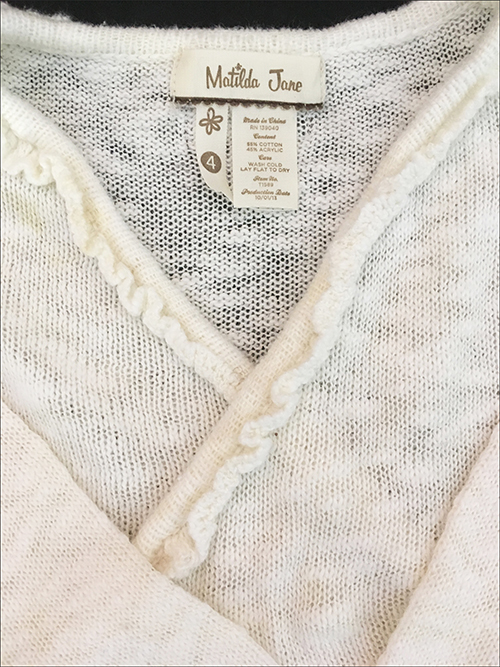 Size 4, it's about 68cm around the chest under the arms and 46cm long shoulder to hem, and is in excellent, gently used condition. 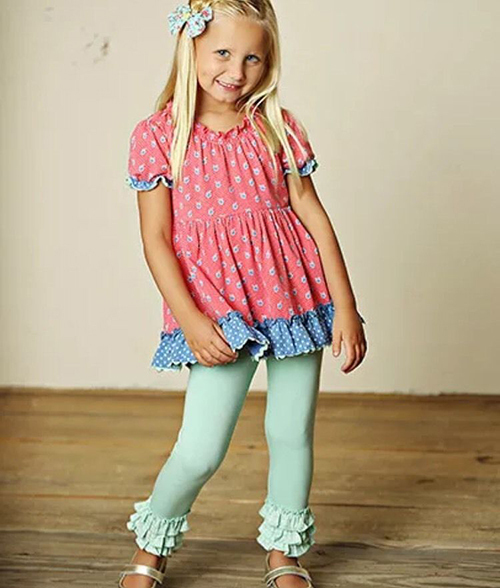 This is the gorgeous Clover dress from Matilda Jane's Friends Forever collection, in a soft, stretchy and comfortable 95% Cotton 5% Spandex with a shirred, elasticised waistband and double frilled hemline. 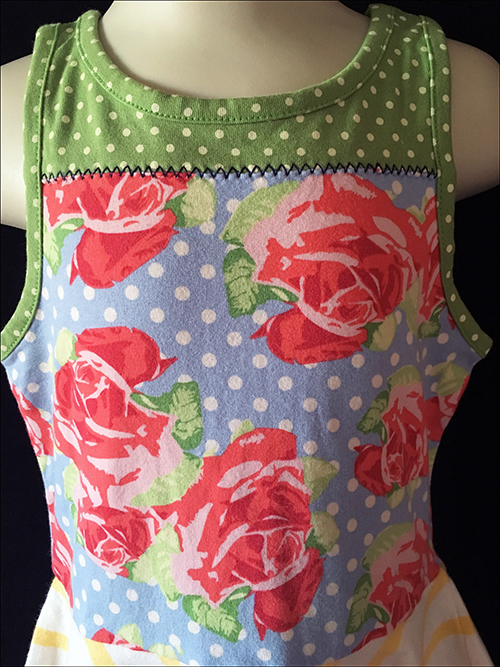 Size 4, it's about 58cm around the chest under the arms unstretched and 58cm long shoulder to hem, and in excellent, gently used condition. 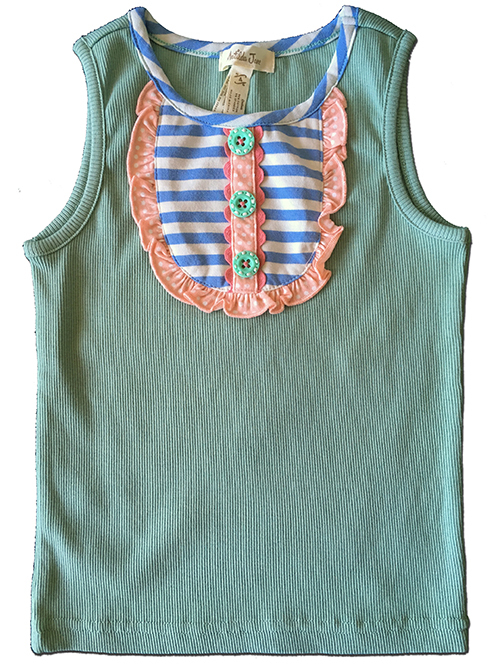 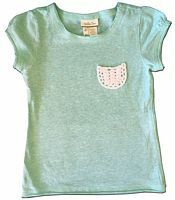 This is the adorable Arcade Cookie tank top from Matilda Jane's Happy and Free collection, in a sage green ribbed 95% Cotton, 5% Spandex blend, with a fun striped and spot jersey bodice detail. 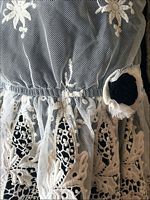 Size 4, it measures about 56cm around the chest under the arms and 40cm long shoulder to hem, and is in flawless condition - I suspect it is New Without Tags. 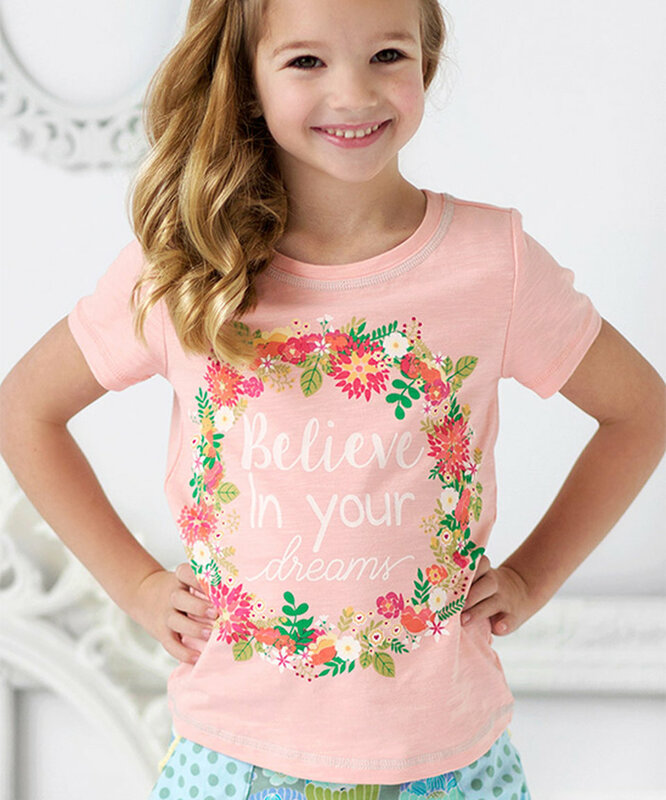 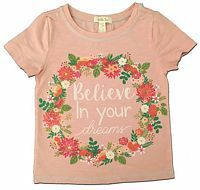 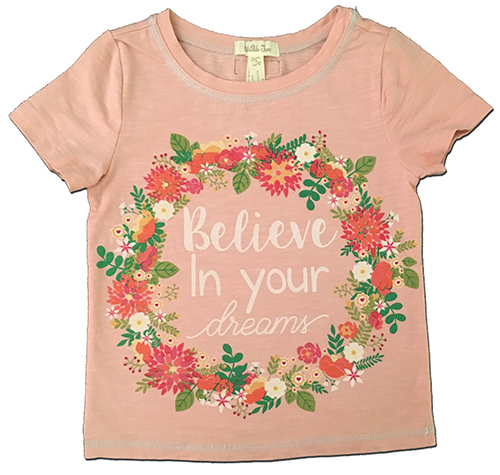 This is the beautiful Believe in Your Dreams t-shirt from Matilda Jane's Happy and Free collection, in a peach pink cotton spandex with the gorgeous chest print as shown. 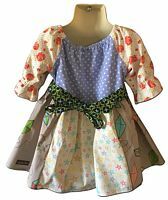 Size 4, it's about 58cm around the chest under the arms and 39cm long shoulder to hem, and in flawless, as-new condition with no wash fade or wear. These are the fun Dainty and Delicious shorties from Matilda Jane's Happy and Free collection, in a pretty floral 95% Cotton 5% Spandex, with cute double ruffle trims on the legs. 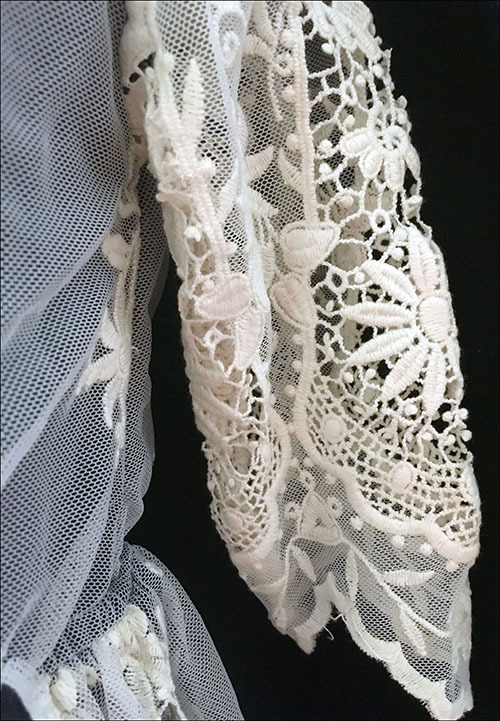 These are a Size 4, measuring about 25cm long on the outer legs and 10cm long on the leg inseam, and are in excellent, gently used condition. 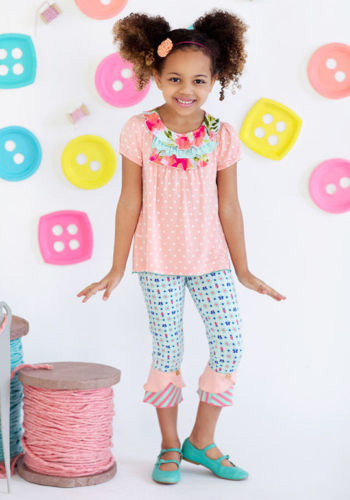 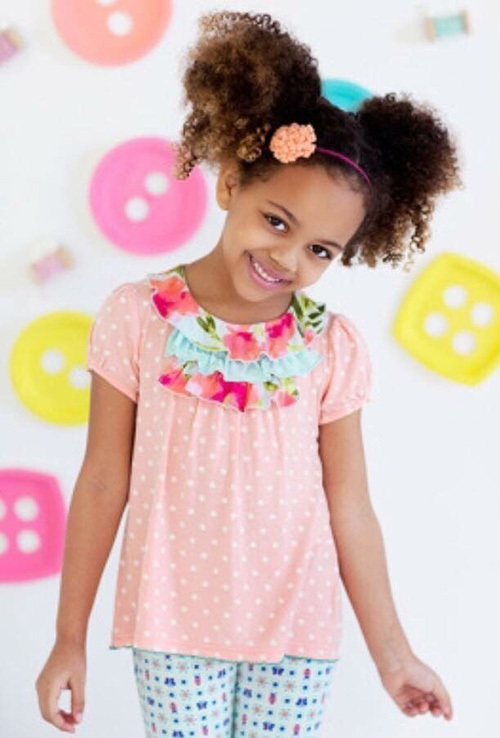 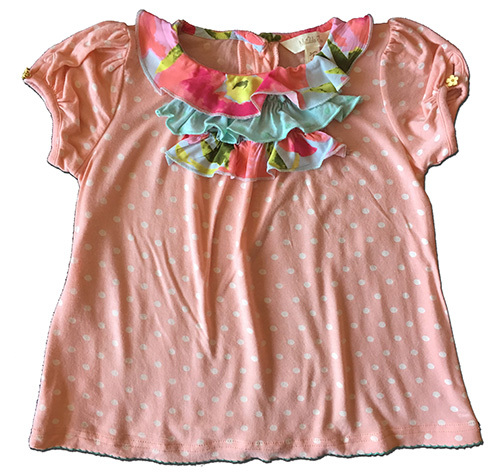 This is the beautiful Chiffon Cake top from Matilda Jane's Happy and Free collection, in a pink polkadot soft and stretchy 95% Cotton 5% Spandex blend with triple ruffles on the neckline in a vibrant floral, and mint coloured flower-shaped rear buttons. 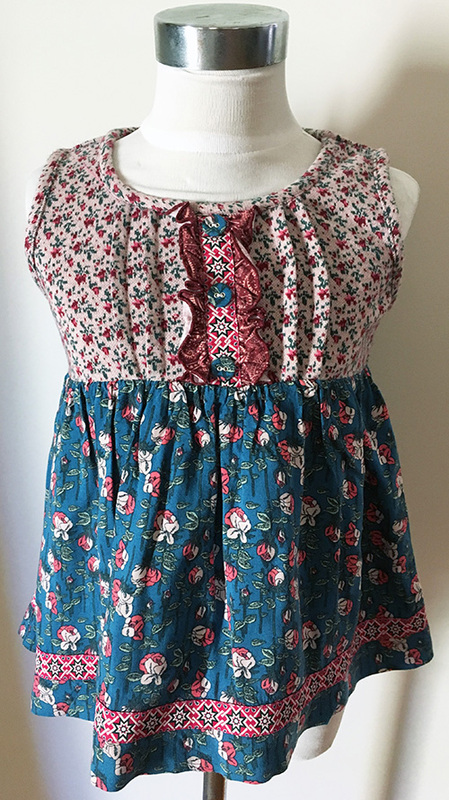 Size 4, it's about 72cm around the chest under the arms and 41cm long shoulder to hem, and is in flawless condition - could pass for new without tags. 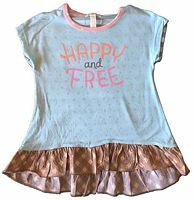 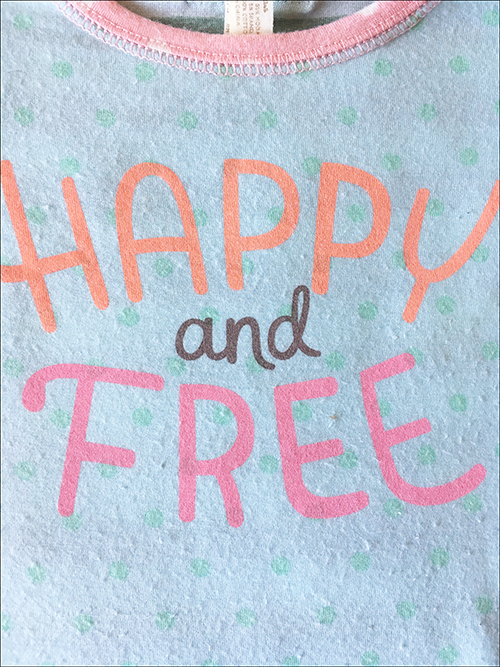 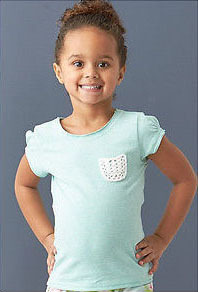 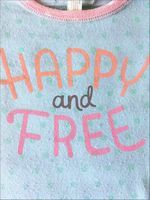 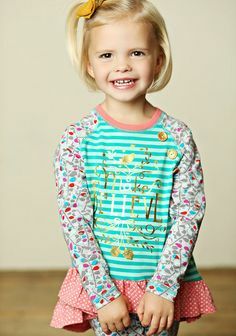 This is the sweet Happy and Free graphic tee from the Matilda Jane collection of the same name, in a super soft and stretchy 95% Modal 5% Spandex jersey with a cotton frill trim. 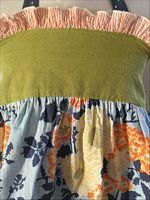 Size 4, it's about 62cm around the chest under the arms unstretched 42cm long shoulder to front hem, and 48cm long to the rear hem, and is in great used condition with just some mild pilling starting to develop to the front. 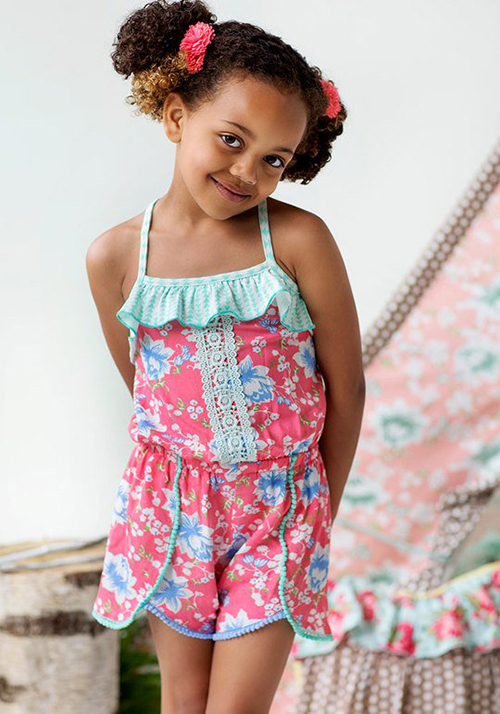 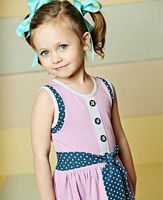 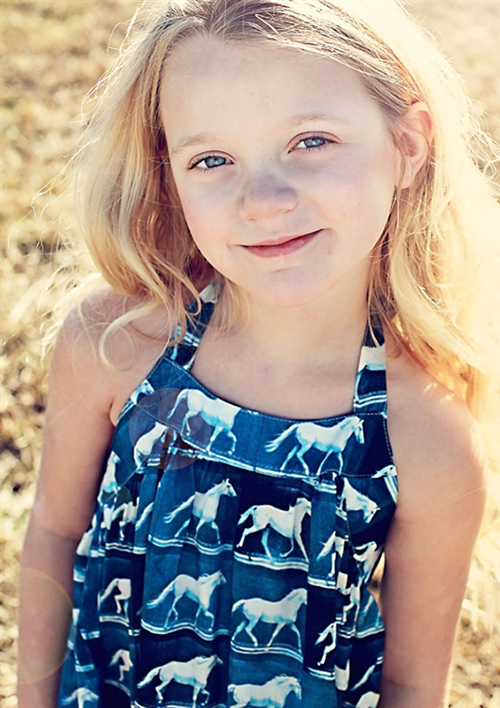 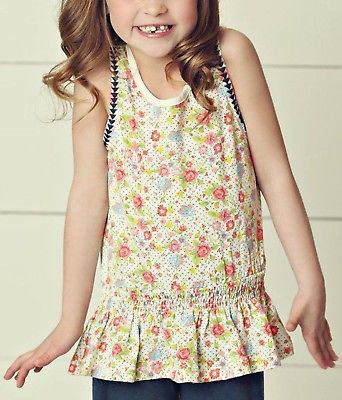 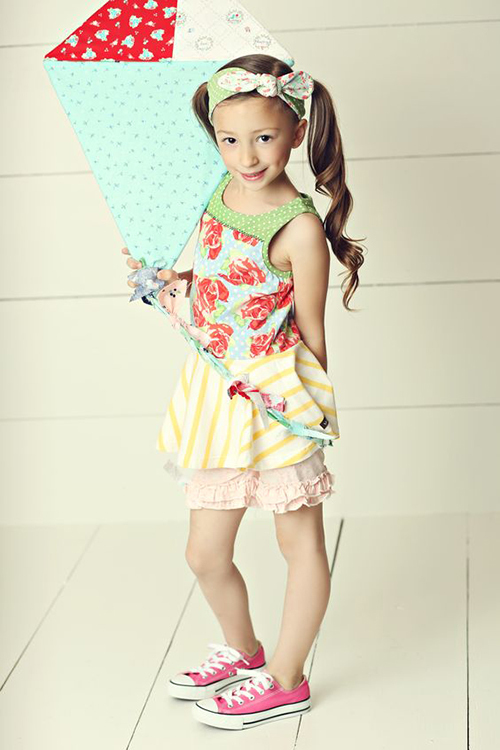 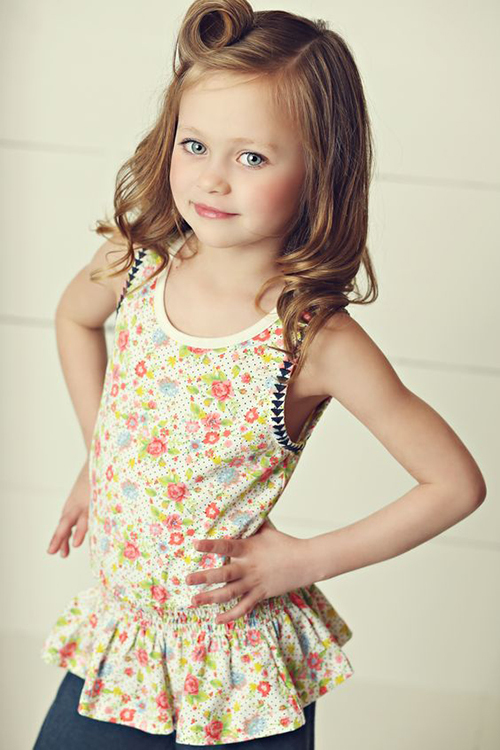 These adorable shortalls are called the Tropical Butterfly Romper, from Matilda Jane's Happy and Free collection. 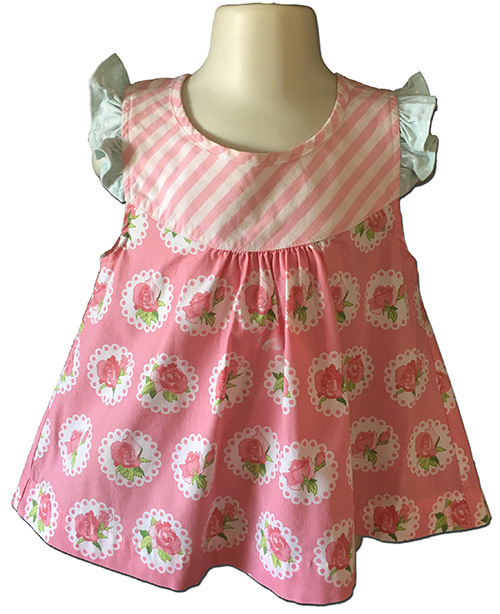 They're in a beautiful watermelon pink floral Rayon and feature an elasticised waist and back panel, rear-cross shoestring straps and fun pom-pom trims. 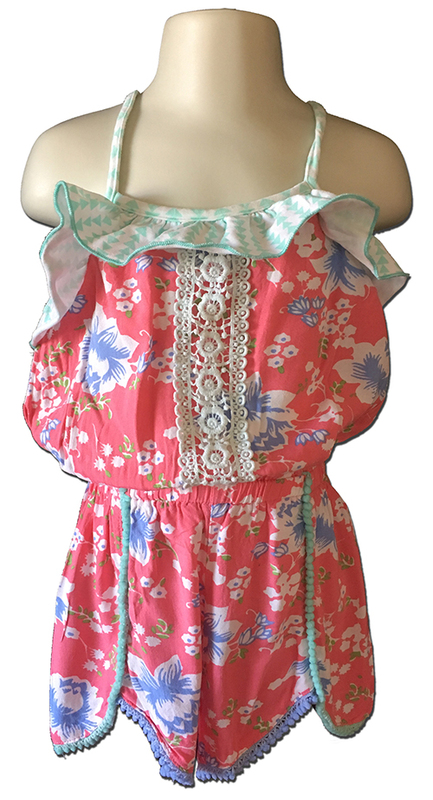 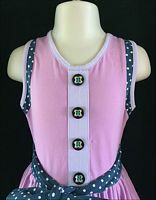 Size 4, this romper is about 54cm around the chest under the arms unstretched, and is in excellent, barely used condition. 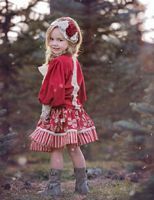 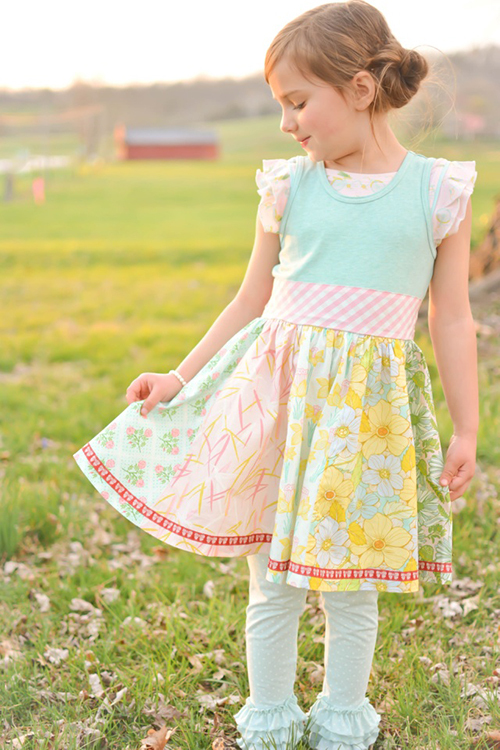 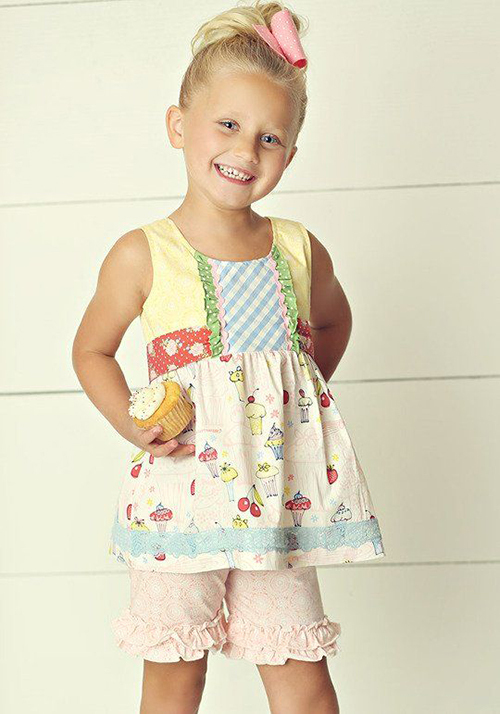 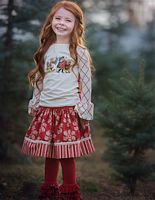 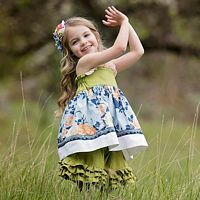 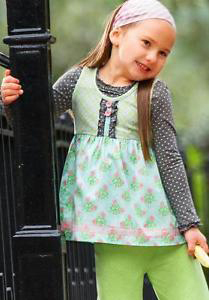 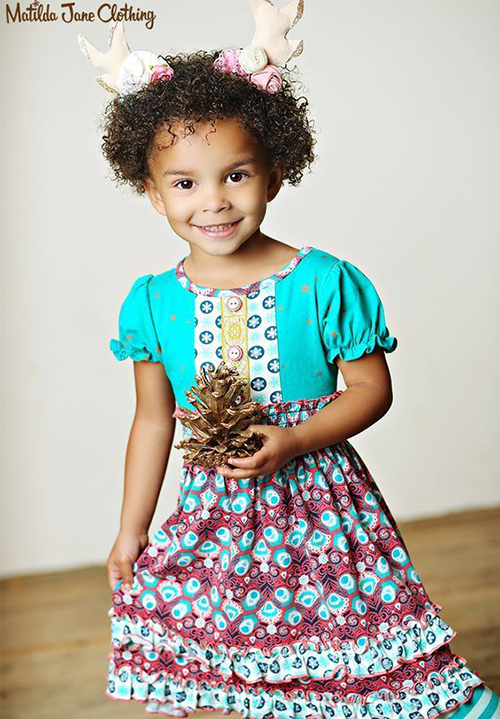 This is the beautiful Oh So Lovely Shasta top from Matilda Jane's Vault, with a soft and stretchy jersey bodice falling to a divine rose print skirt, with rear-tie waist sashes and a vintage-style bird print brocade trim. 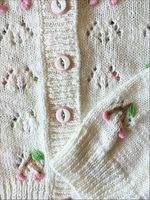 Size 4, it's about 58cm around the chest under the arms unstretched and 43cm long shoulder to hem, and is in excellent, gently used condition. 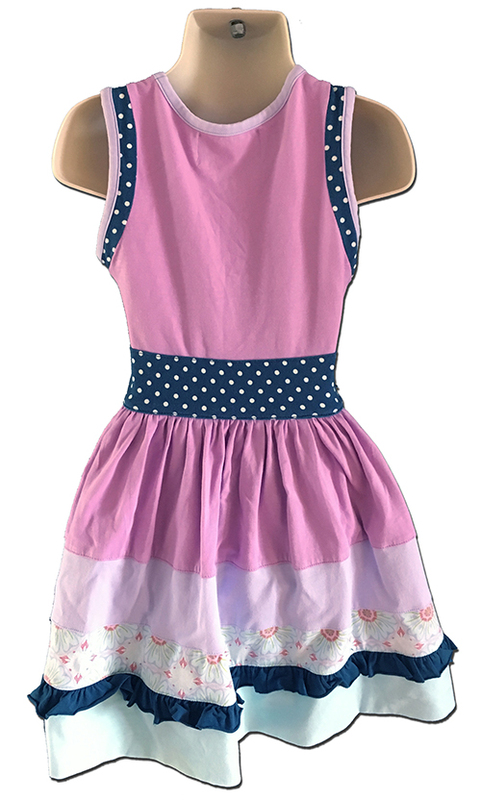 This is the lovely Pier dress from Matilda Jane's Good Hart collection, in a super comfy stretch 95% Cotton 5% Elastane blend and the prettiest mix of shades including lilac, lavender, mint and a deep blue polkadot waist sash which you can choose to tie front or back. Size 4, it's about 56cm around the chest under the arms unstretched and 59cm long shoulder to hem, and in excellent, gently used condition. 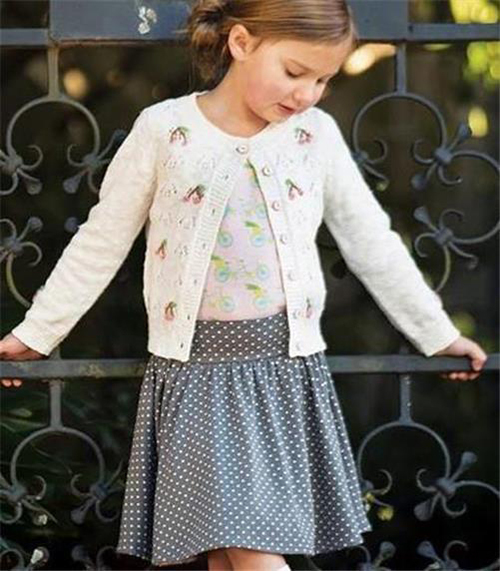 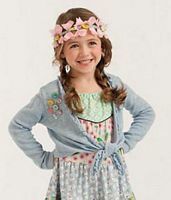 This is the adorable Dandy Shrug from Matilda Jane's It's a Wonderful Parade collection, in a soft 55% Cotton 45% Acrylic blend and featuring a tie front and a pretty assortment of decorative buttons on the right shoulder. 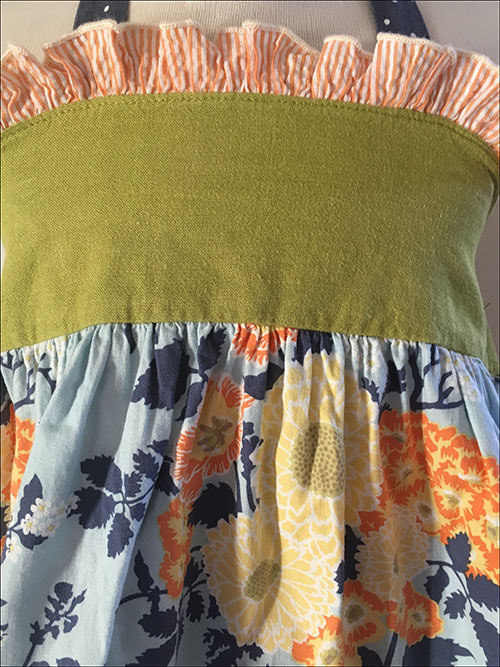 Size 4, it's about 64cm around the chest under the arms and 31cm long shoulder to hem, and is in excellent, gently used condition overall but priced cheaply as the right cuff has some discolouration as shown - it's not as noticeable in life as it is in the photo but it is there. 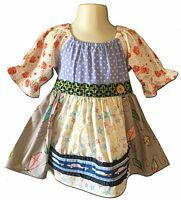 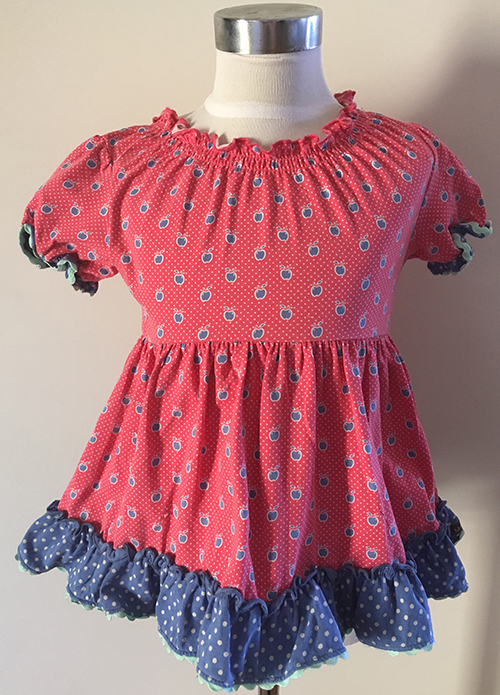 This is the adorable Float Shrug from Matilda Jane's It's a Wonderful Parade collection, in a soft 55% Cotton 45% Acrylic blend and featuring a tie front and a pretty frill accent to the chest. 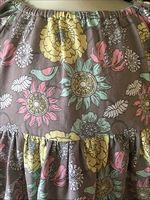 Size 4, it's about 66cm around the chest under the arms and 26cm long shoulder to hem, and is in excellent, gently used condition. 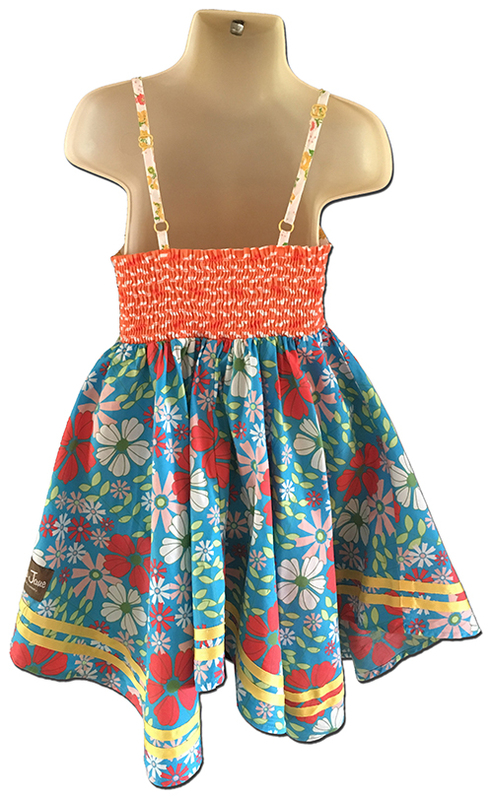 These are the fun French Fry shorties from Matilda Jane's It's a Wonderful Parade collection, in a red and yellow floral combo that does bring to mind a certain large food chain's famous fries! 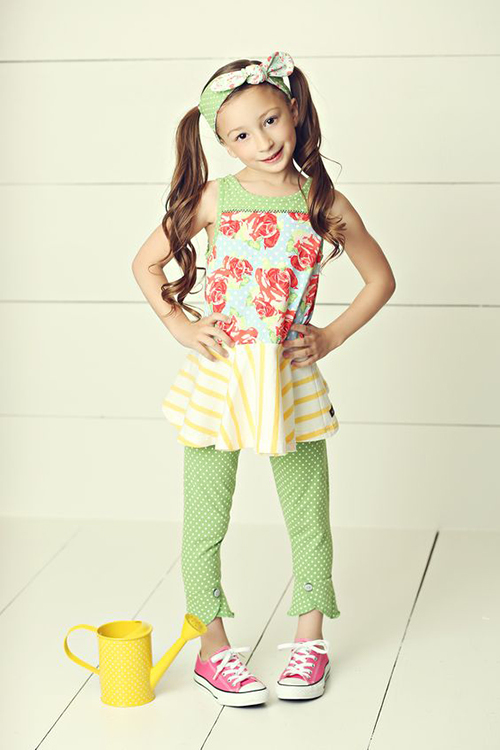 These are in a 95% Cotton 5% Spandex, with cute double ruffle trims on the legs. 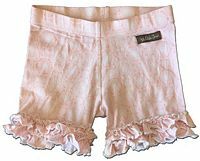 These are a Size 4, measuring about 24cm long on the outer legs and 10cm long on the leg inseam, and are in excellent, gently used condition. 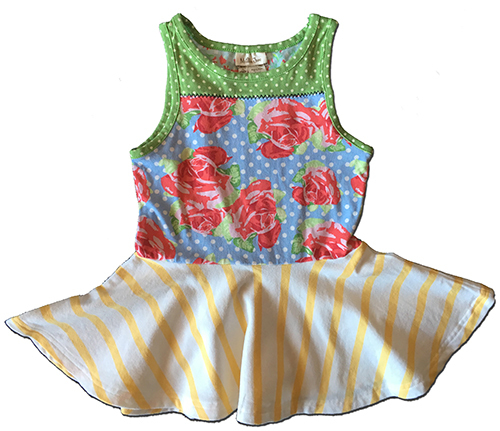 This is the gorgeous Favourite Things Peasant top from Matilda Jane's It's a Wonderful Parade collection, in a gorgeous mix of fabrics including a soft jersey rose print and polkadot bodice, kites and stars on the skirt, Retro-style cars on the brocade trim and rear-tie waist sashes. 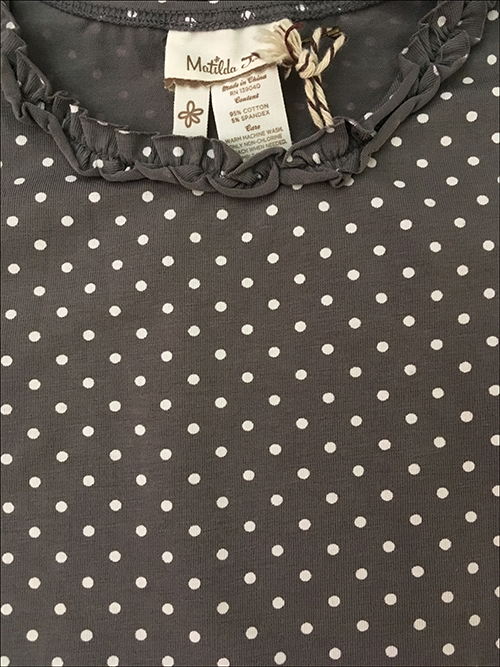 Size 4, it's about 64cm around the chest under the arms unstretched and 44cm long shoulder to hem, and is brand new with tags attached. 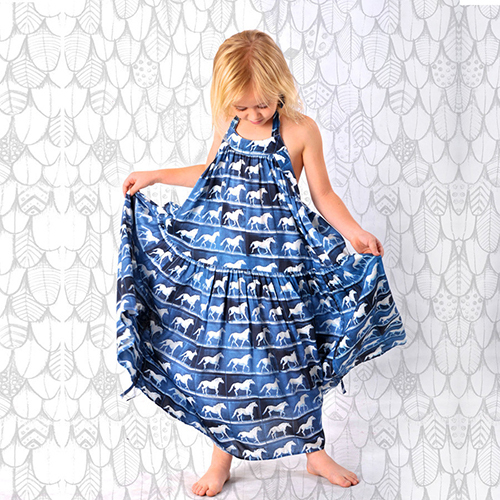 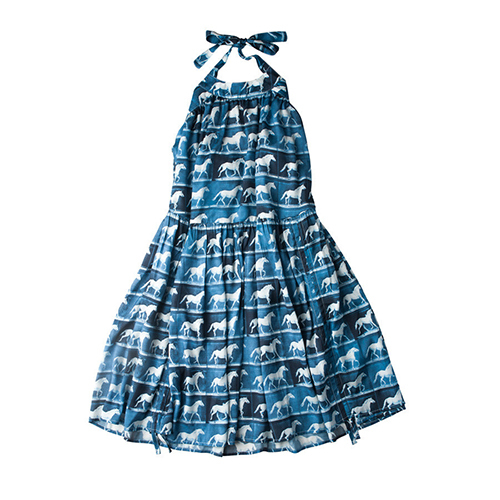 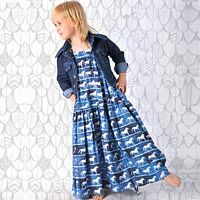 On offer is the gorgeous Paperwings horse print maxi halterneck dress, in a super-soft and flowing cotton, featuring a shirred/elasticised low back with fab drawstring ties on the hemline allowing you to ruche the skirt up as you choose. 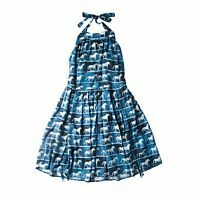 Girls love this dress! 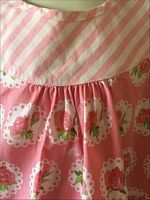 A generous Size 4, it measures about 66cm long from the centre of the front bodice to the hem, with the overall length adjustable, and is in excellent, barely used condition with the only flaw I can find (and I only found it on the final inspection after washing, ironing and photographing, showing just how much it blends in!) 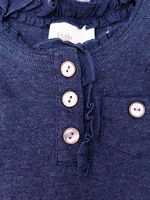 being a blue watercolour mark on the very bottom right hand side hem as shown. 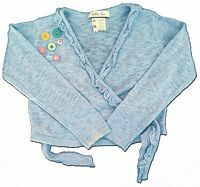 It may soak out, I haven't tried, but otherwise would absolutely never be seen when worn given the colour and location. 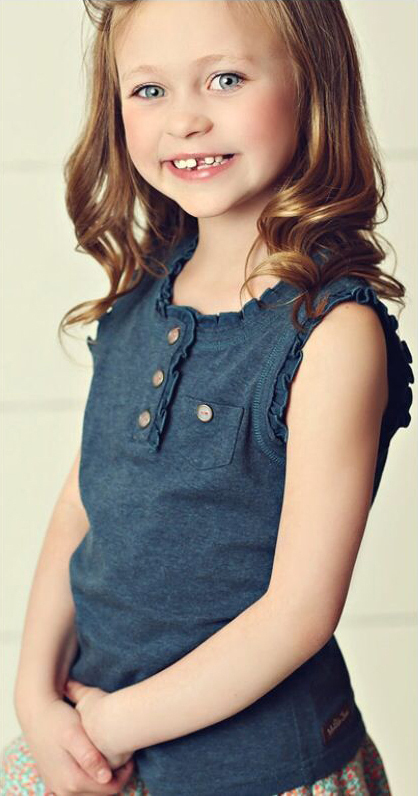 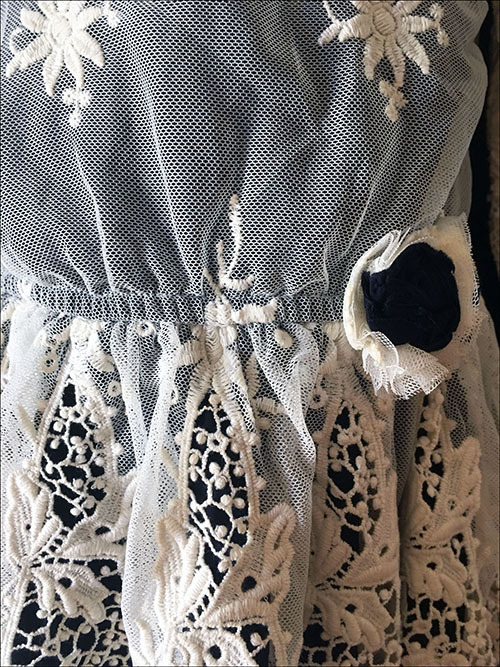 This exquisite special occasion piece from A.Bird Children's Clothing in New York is the Navy Grace Lace Dress, sewn in a base layer of navy blue polyester with the most amazing ivory lace overlay. 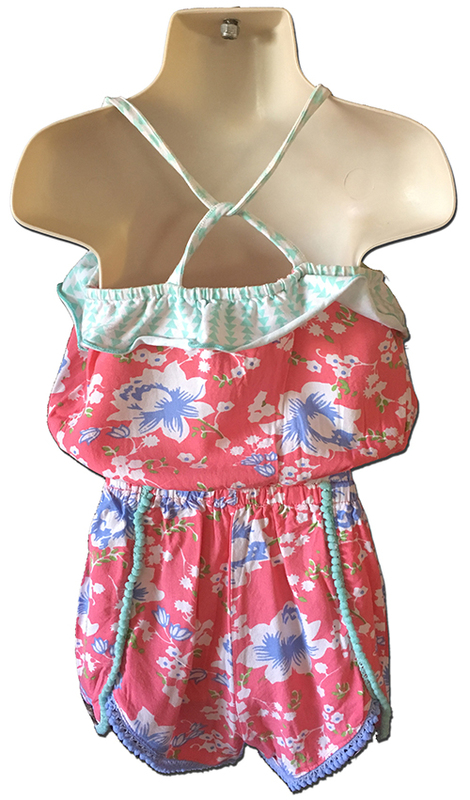 It features a concealed rear zip and an elasticised waistband with rose detailing, and is a Size 4, measuring about 56cm around the chest under the arms and 52cm long shoulder to hem at the longest point. 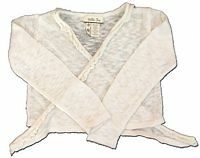 This is brand new with tags attached and an absolute steal at this price. 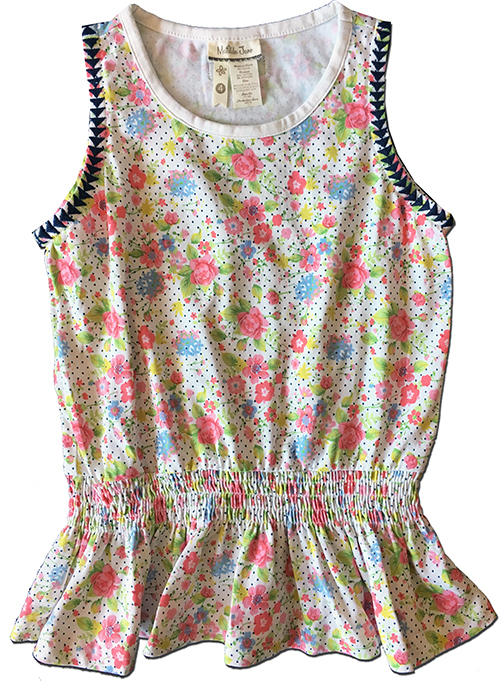 This is the gorgeous Alpine Daisy Betsy halterneck top from Persnickety, in a beautiful floral print 100% Cotton with tie-straps and an elasticised rear bodice. The green fabric on the bodice is the same as used in the Felicity Triple Ruffle Shorts listed below, making them a gorgeous match. 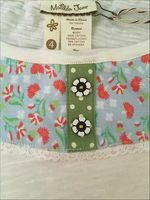 Size 4, it measures (unstretched) about 50cm around the chest under the arms and 37cm long from underarm to hem, with the overall length adjustable. 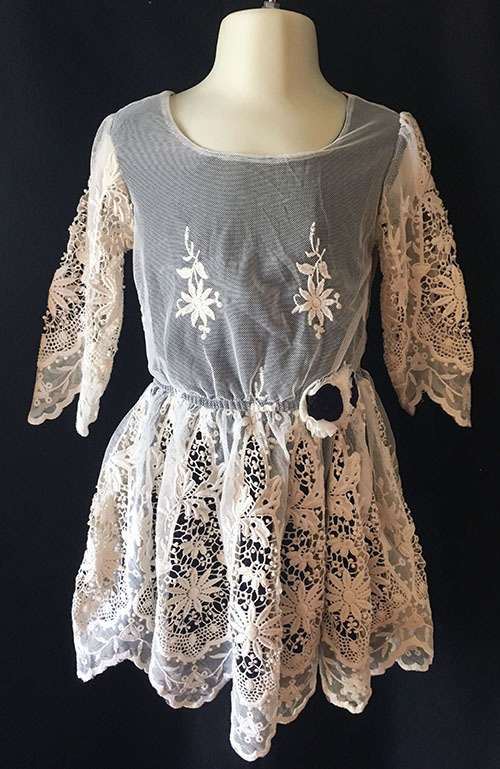 This is in excellent, gently used condition. 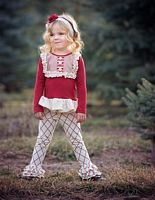 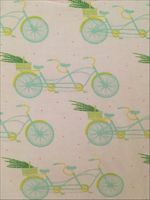 These are the fab Lucy shorties from Persnickety's Daffodils and Dandelions collection, in a raspberry and cream soft and comfortable 47% Cotton, 47% Modal, 6% Spandex blend jersey. 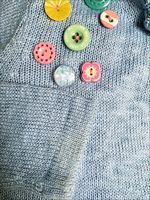 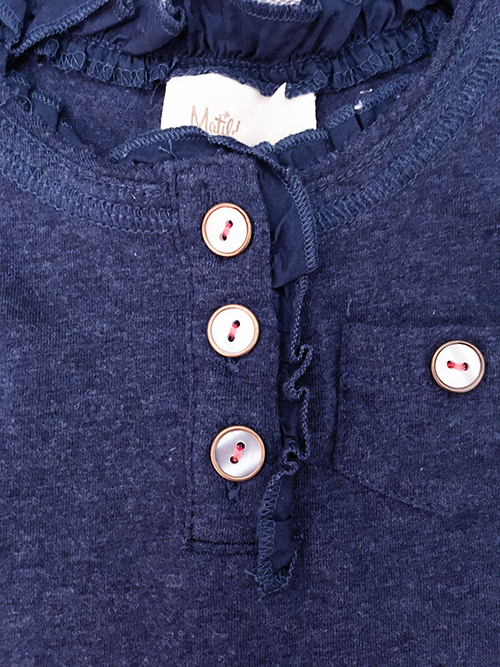 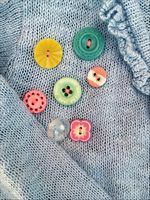 Button accents at the side hems add a fun touch and these will go with so much. 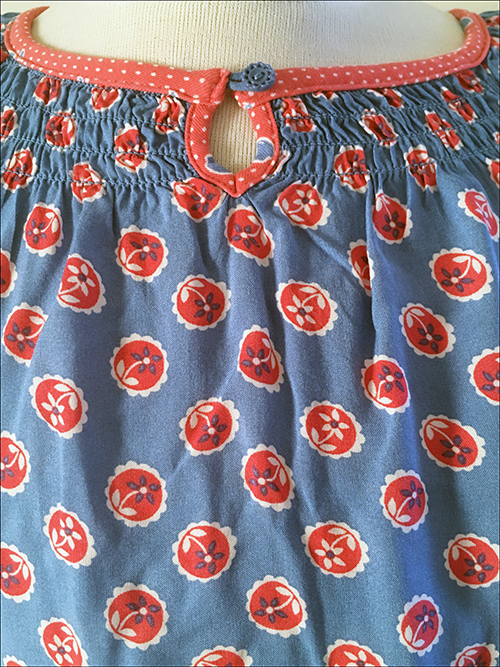 Size 4, they're about 26cm long waistband to hem and 15cm on the leg inseam, and in excellent, gently used condition. This is the gorgeous Natalie Sweater from Persnickety's Forget Me Not collection - essentially an open cardigan with bell sleeves and a ruffled neckline, it's in an orange 21% Polyester, 42% Rayon, 5% Spandex blend...very soft and stretchy. Tagged Size 4, it measures (unstretched) about 74cm around the chest under the arms and 44cm long from underarm to front hem with a longer front panel. 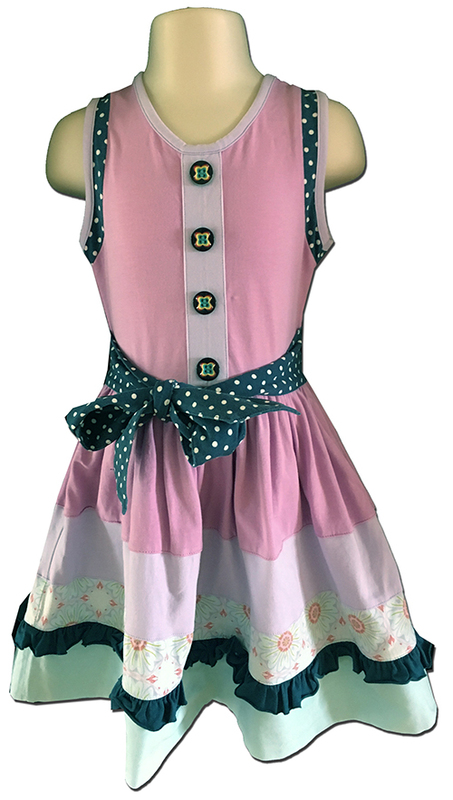 This is in excellent, gently used condition. 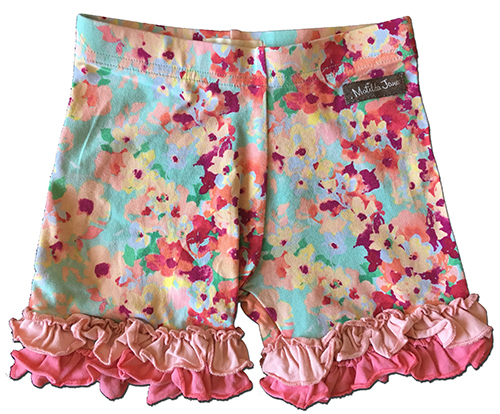 These are the beautiful May ruffle shorts from Persnickety's Garden Party collection, in a light and floaty 100% cotton voile with one of the most beautiful prints Persnickety has released. 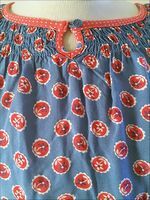 Size 4, they're about 31cm long waistband to hem and 13cm on the leg inseam, and in excellent, gently used condition. 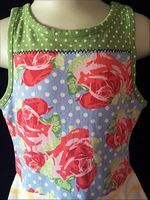 The matching Garden Party Lou Lou top shown in the second stock photo is listed separately in a Size 6, if you can make the sizing work for you - they do tend to run small. 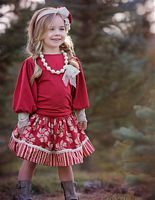 This gorgeous set is comprised of the Lou Lou peplum top and Sadie skirt from Persnickety's Holiday collection. 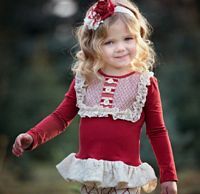 The top is in a rust red 47% Cotton, 47% Modal, 6% Spandex blend jersey, with a gorgeous cream yoke and lace accent to match the soft lace peplum frill. 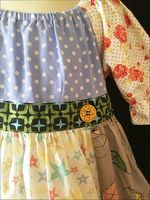 Tagged Size 5, but runs a little small and so best used with the Size 4 skirt, and measures about 60cm around the chest under the arms unstretched and 40cm long from shoulder to hem. The skirt is in a beautiful red and cream cotton with a comfy elasticised waistband, and is a Size 4, measuring about 32cm long waistband to hem. 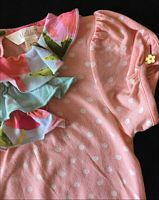 Both pieces are new with tags. 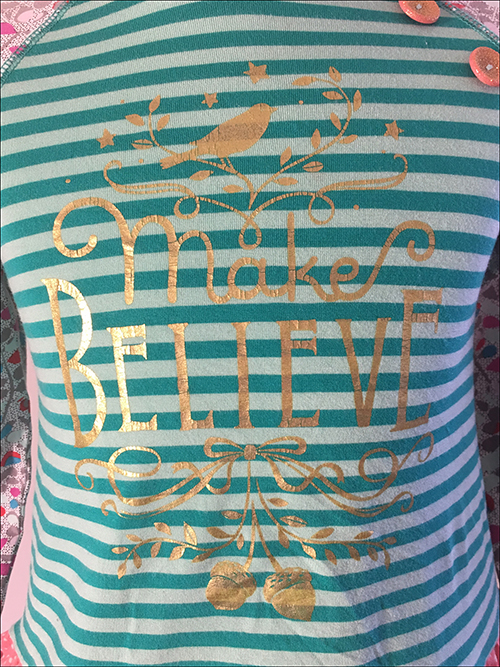 This fun t-shirt from Seed Heritage is in a grey marle 100% Cotton with an amazing metallic gold and sequined crown chest motif. Size 4-5, it's about 66cm around the chest under the arms and 43cm long shoulder to hem and is in excellent, gently used condition with the only flaw being a faint pink mark to the left wrist which may shift with a soak. 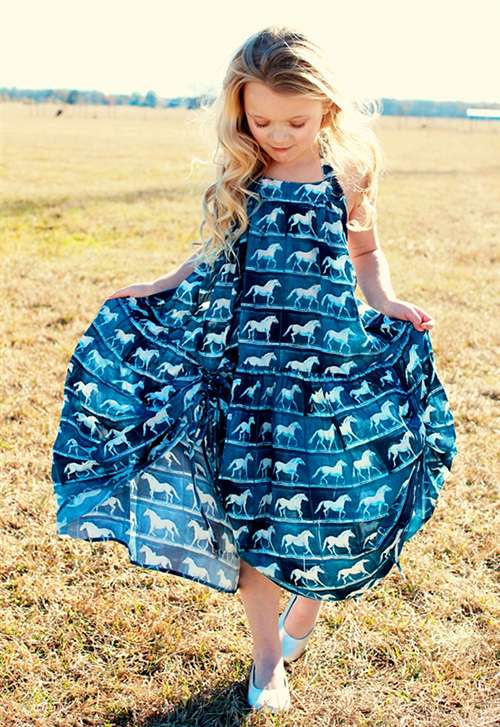 This amazing Custom Boutique set was created by Once in a Blue Moon in the USA. 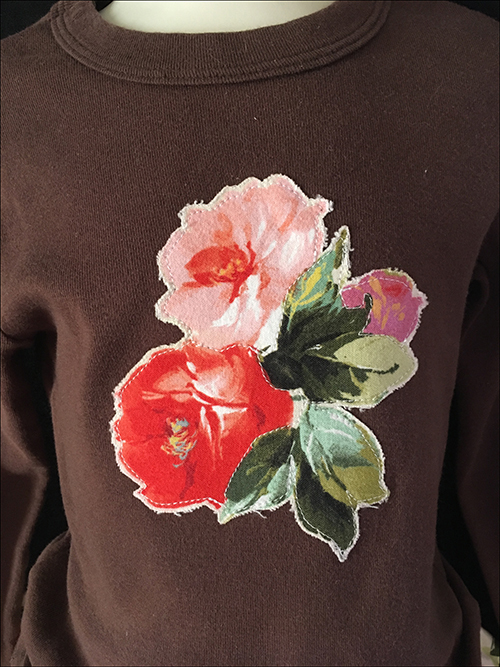 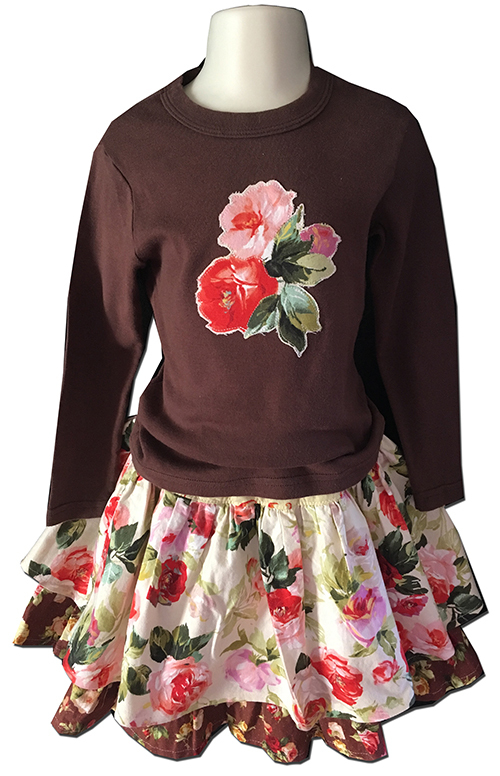 The top uses a base of a brown cotton jersey American Apparel long sleeved tee which has been appliqued with a gorgeous rose from the same fabric as the skirt. 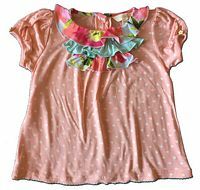 Size 4, it's about 64cm around the chest under the arms and 39cm long shoulder to hem. 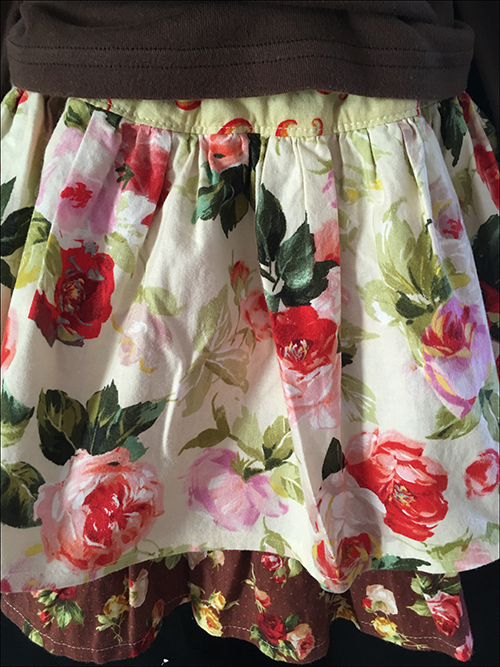 The skirt features an elasticised waistband and then two glorious rose print tiers. 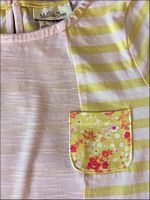 It's about 34cm long from waistband to hem. 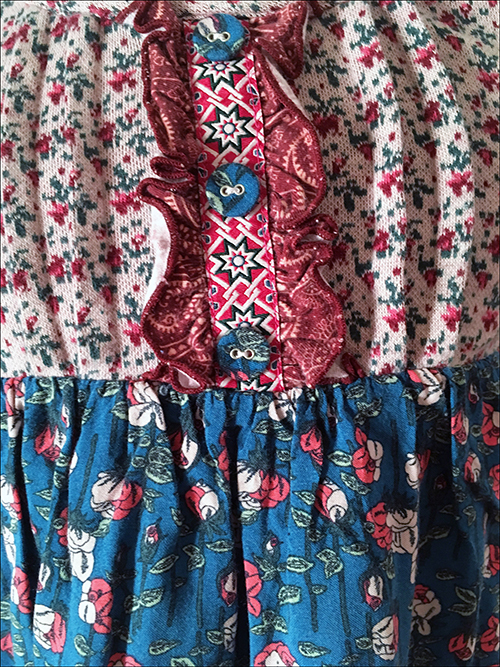 Both pieces are in excellent, barely used condition. 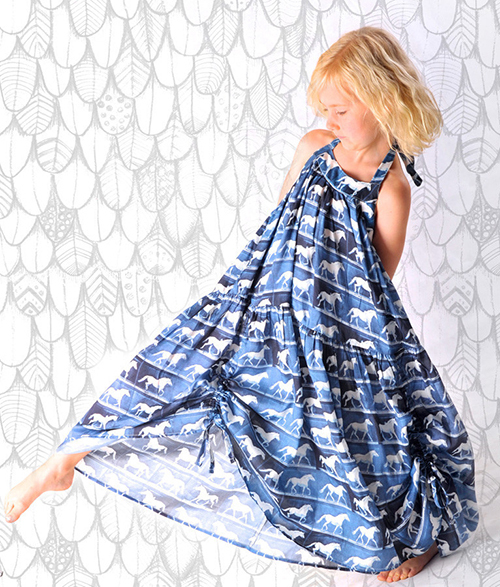 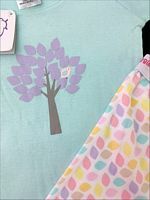 This is a gorgeous pair of prewashed cotton Shortjohn PJs from Australian label Snugglebum. The style name is "Herbal" and they include a mint coloured longline t-shirt with a pretty tree and bird chest motif, as well as comfy white shorts with an all-over pastel leaf print. 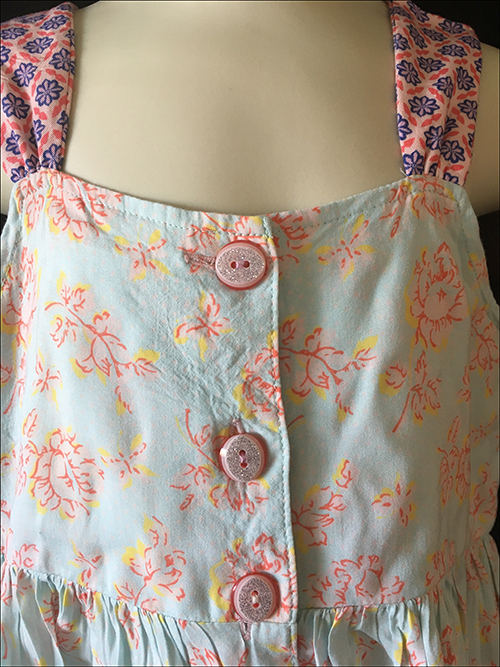 Size 4, the top is about 50cm around the chest under the arms unstretched and 46cm long shoulder to hem, while the shorts are about 26cm long waistband to hem and 7cm on the leg inseam. 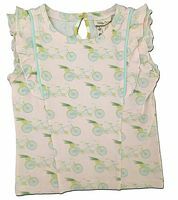 New with tags, these retailed at $43.